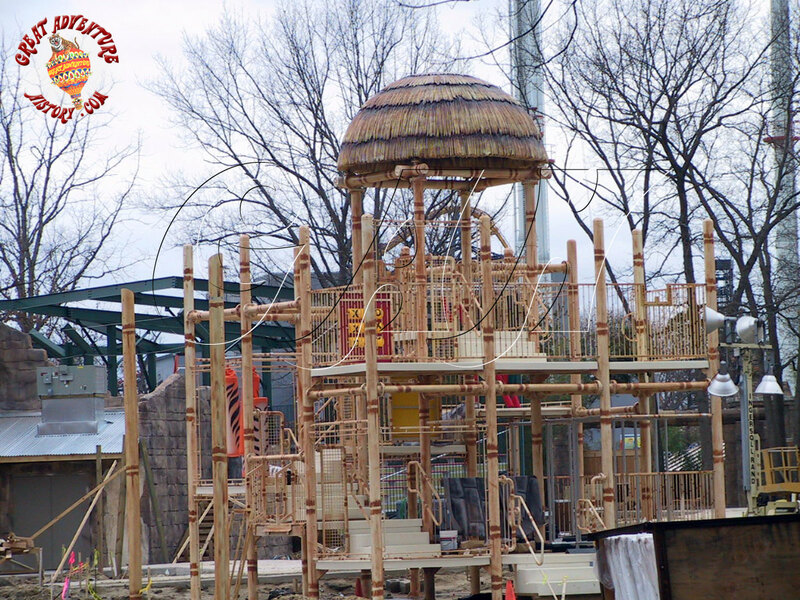 In the history of Great Adventure there have been only a few new themed areas added to the park, and in all of the park’s history, The Golden Kingdom was the largest and most ambitious addition. 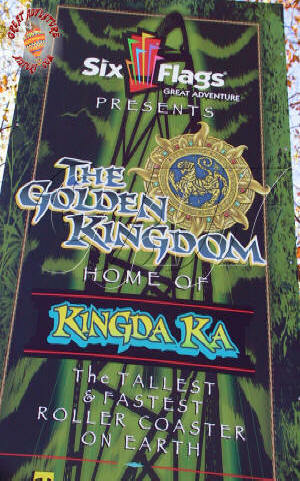 Taking over the area that had been Bugs Bunny Land and expanding beyond into the parking lot, The Golden Kingdom was to be the most fully immersive environment with lavishly themed rides and structures set in a jungle of greenery. 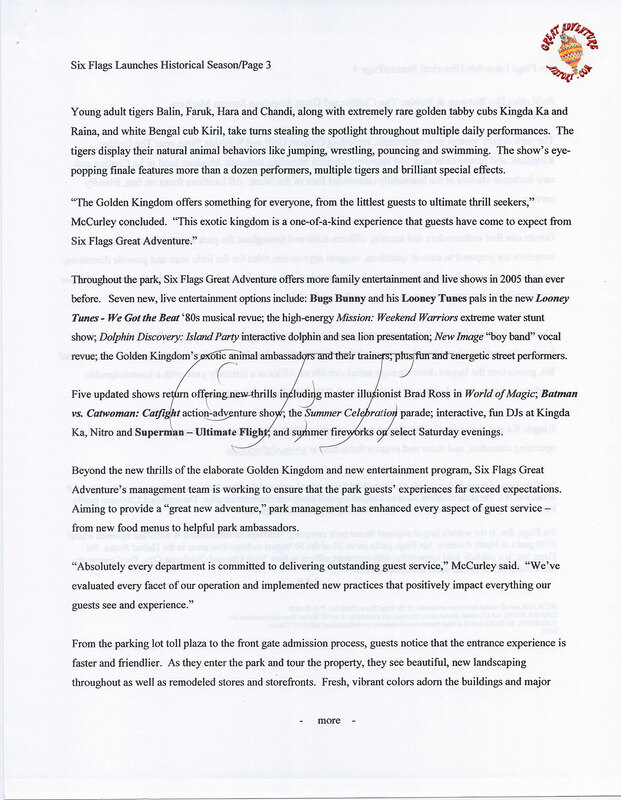 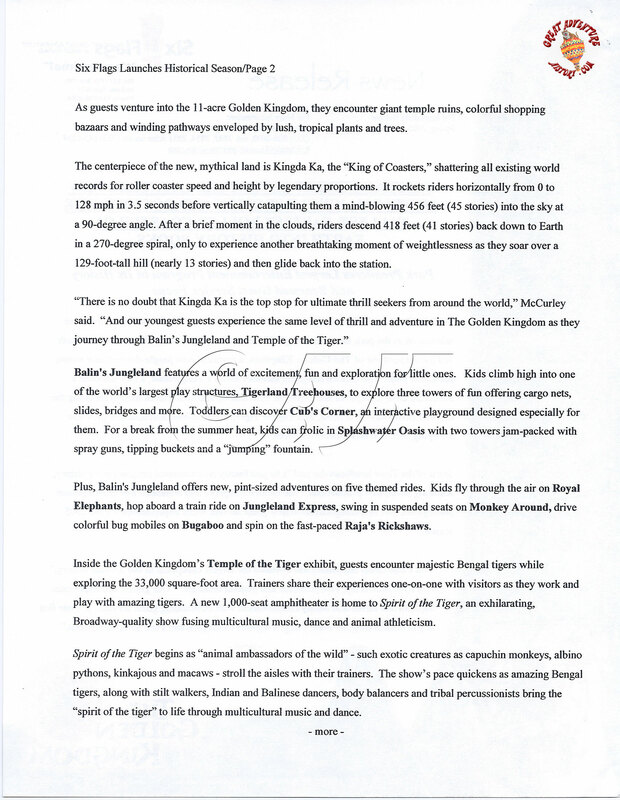 The idea behind the Golden Kingdom was to incorporate attractions for the whole family and bring a new animal attraction into the theme park. 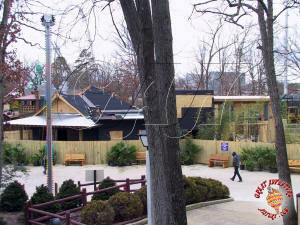 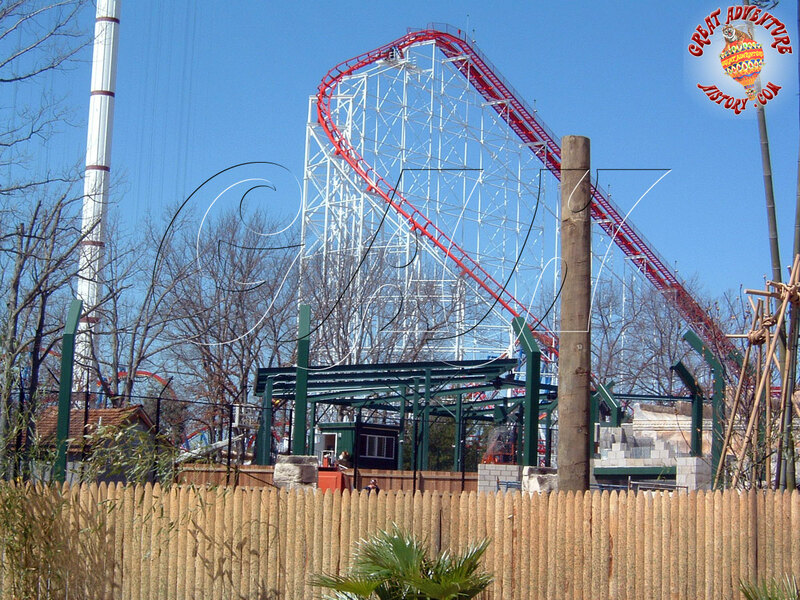 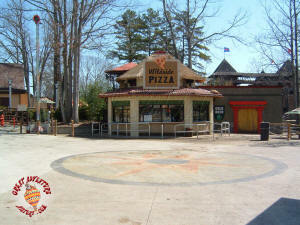 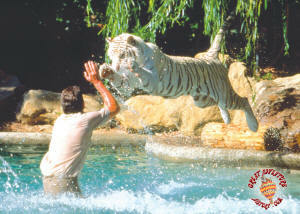 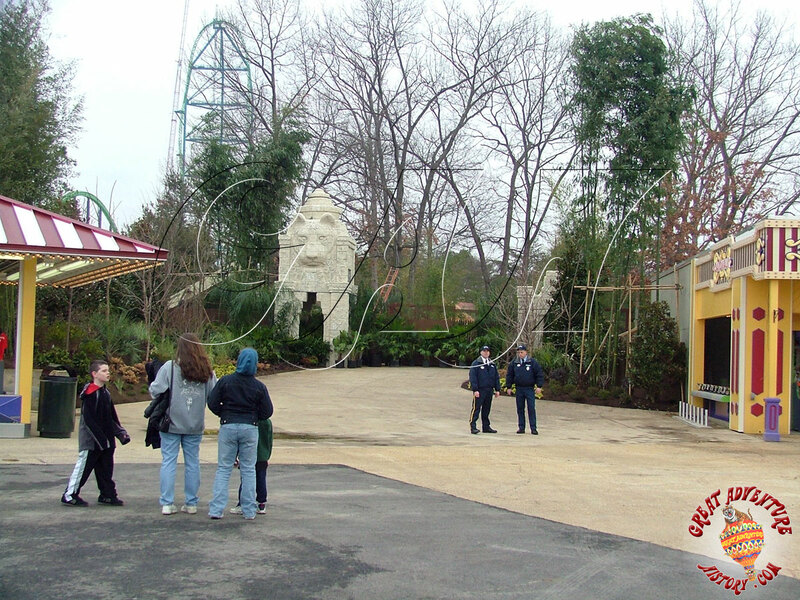 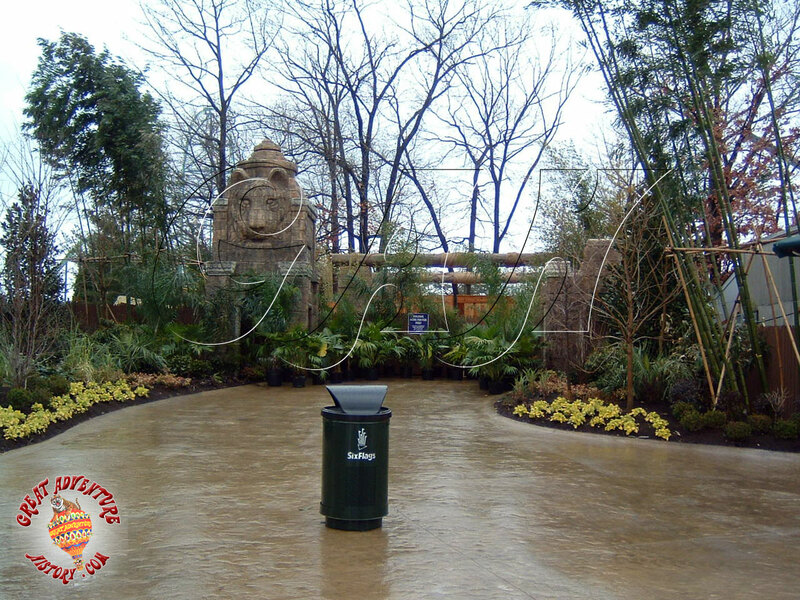 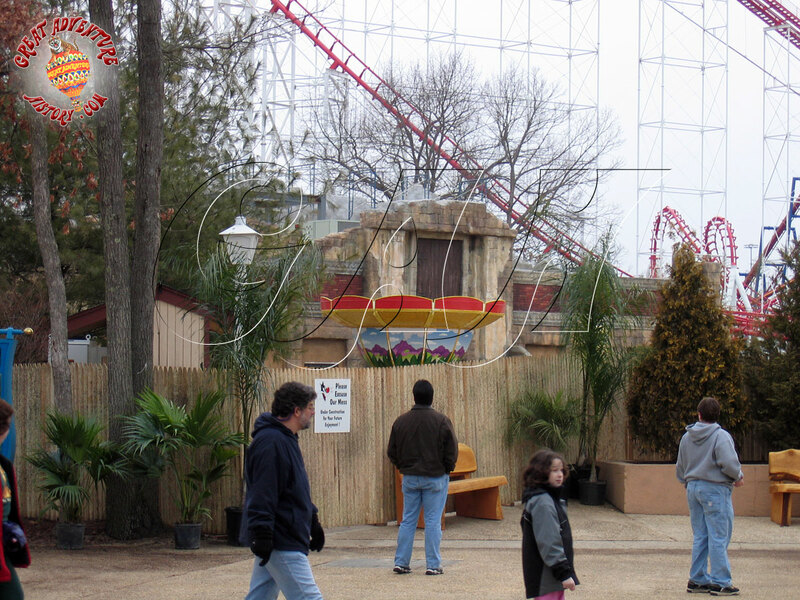 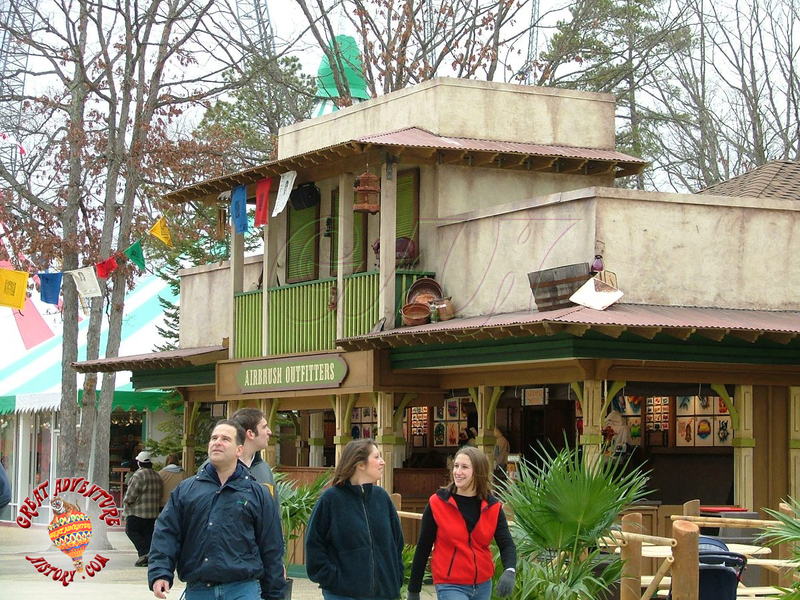 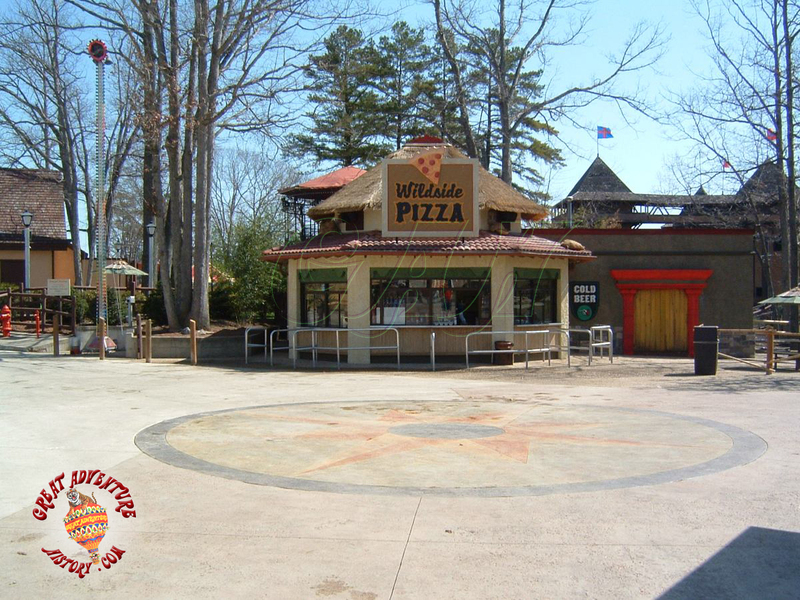 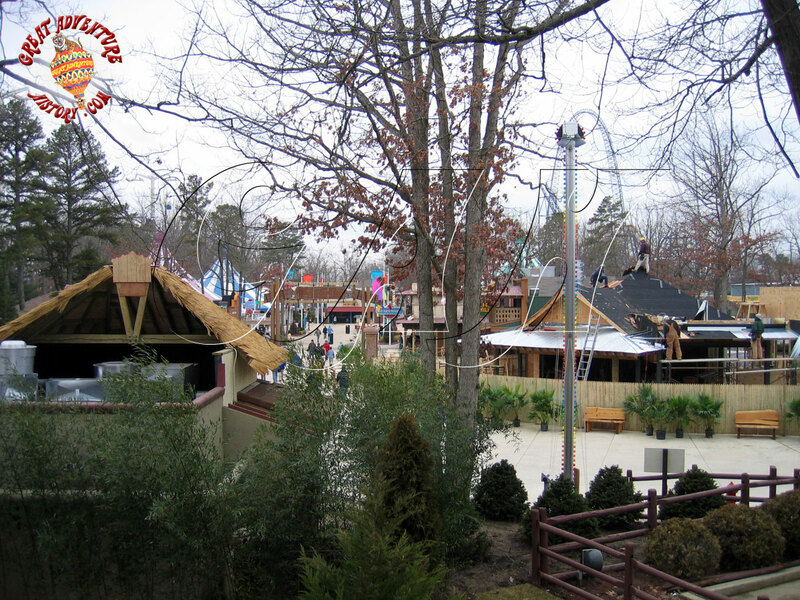 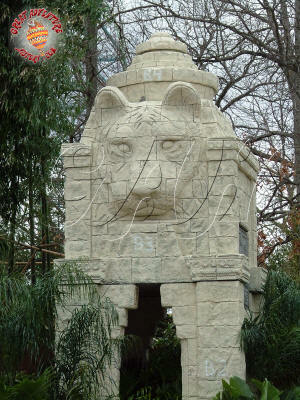 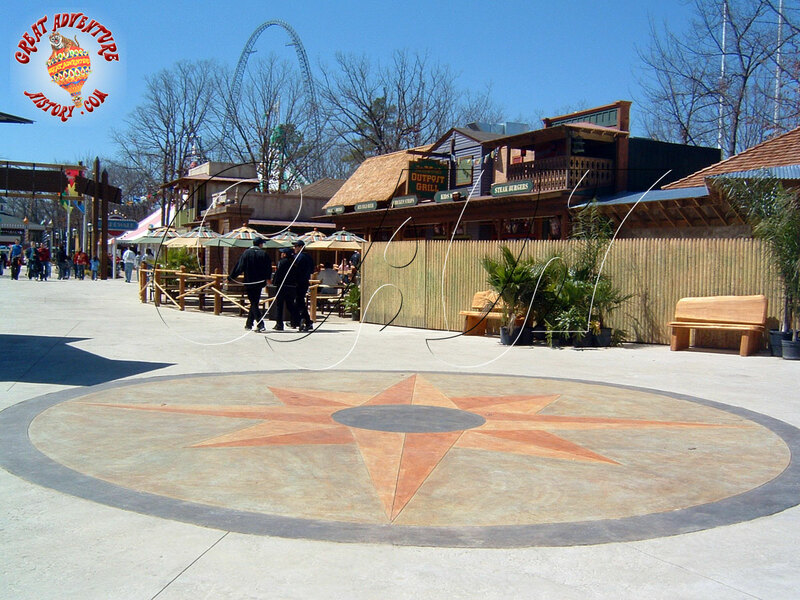 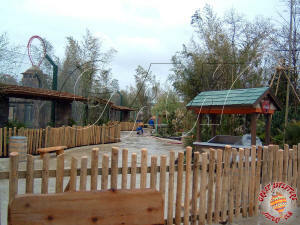 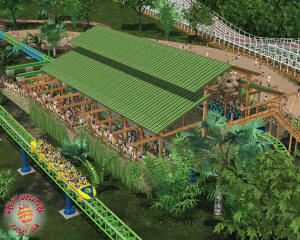 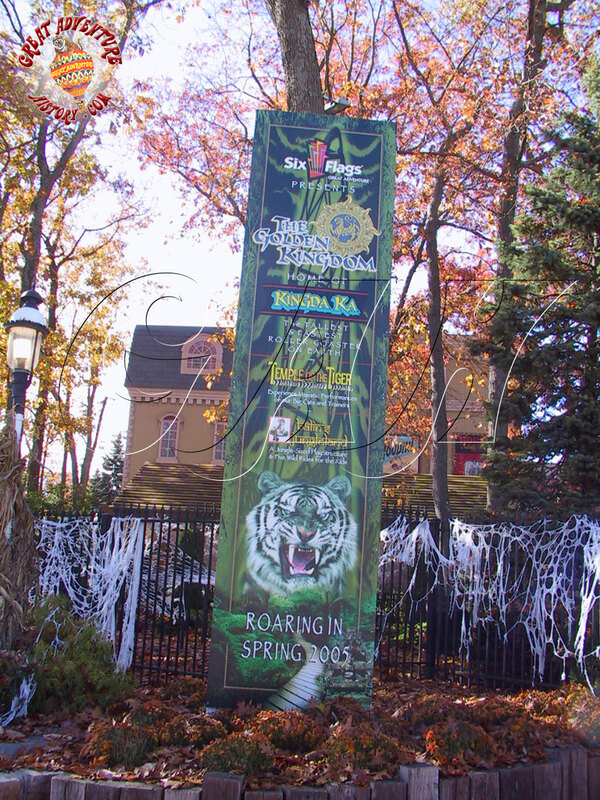 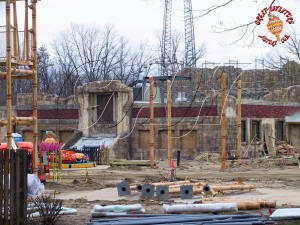 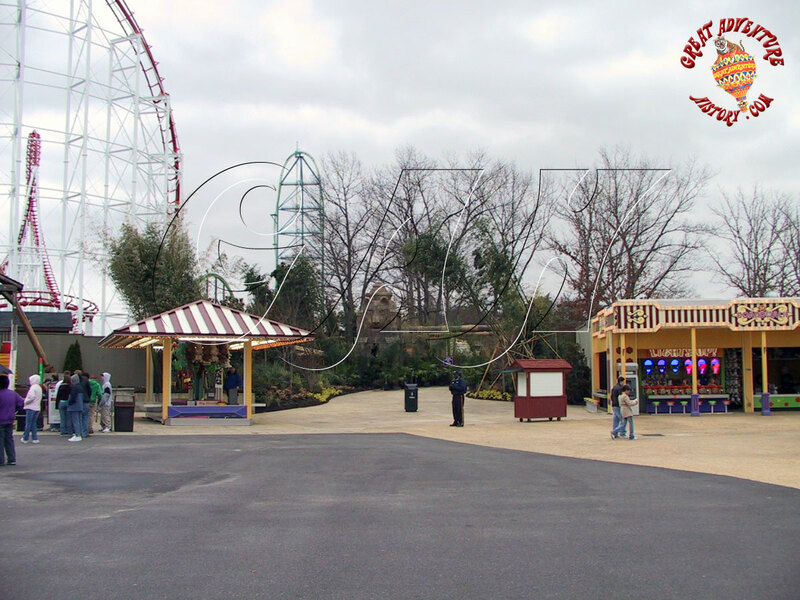 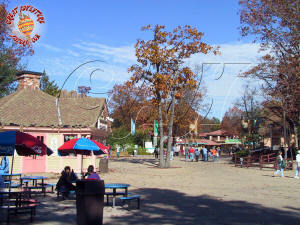 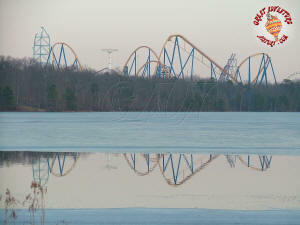 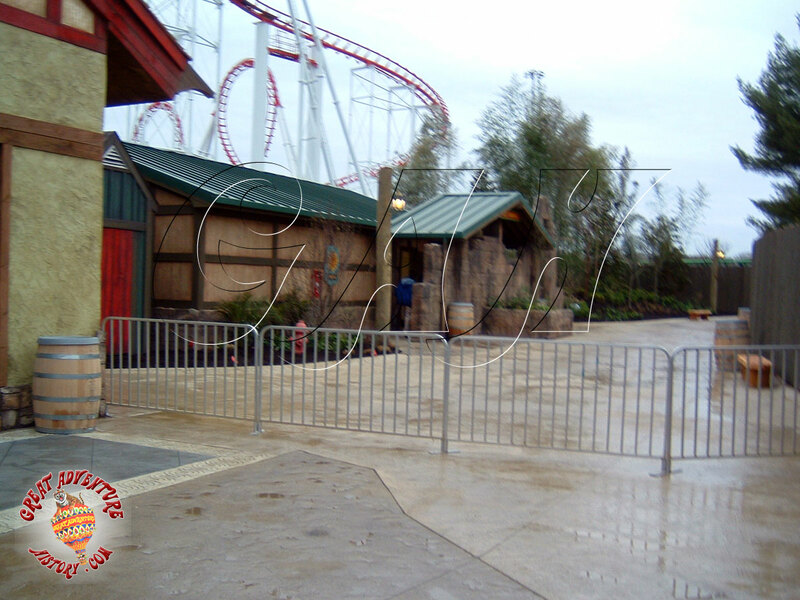 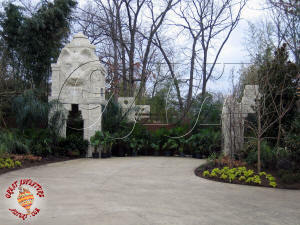 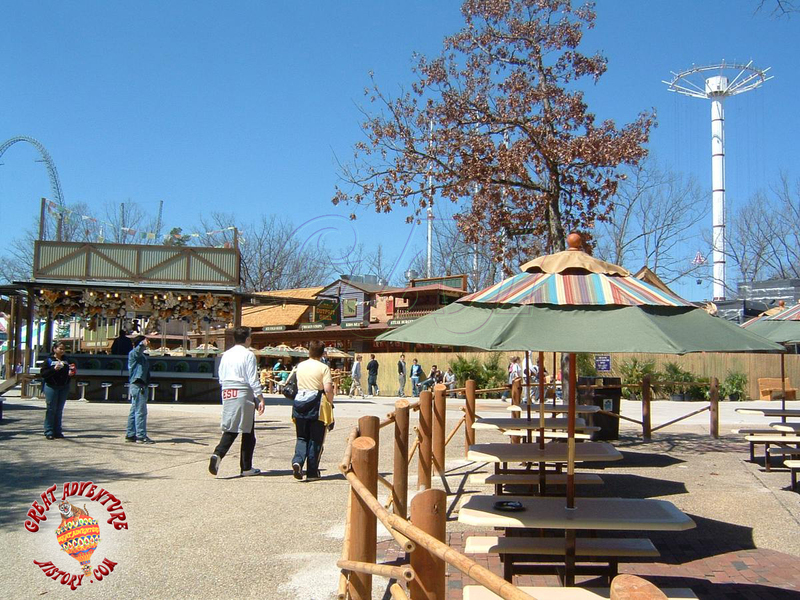 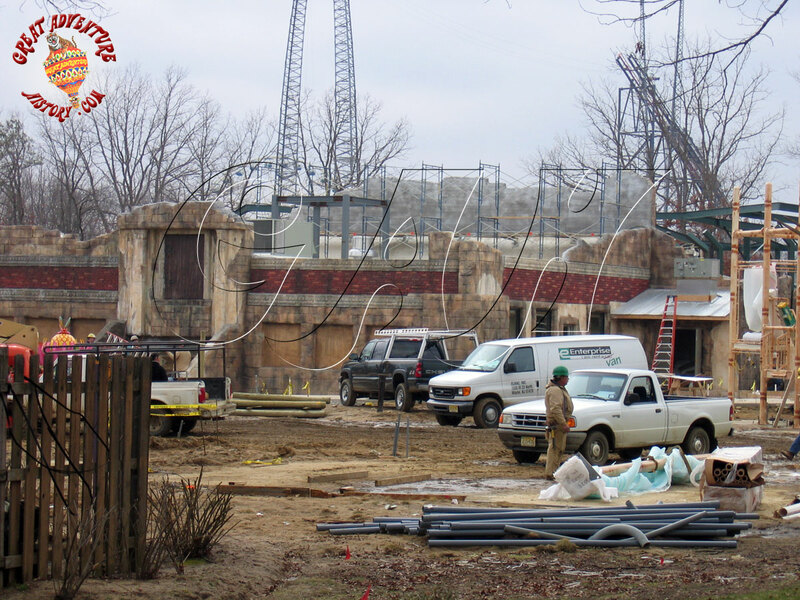 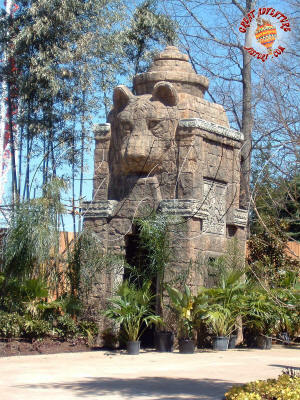 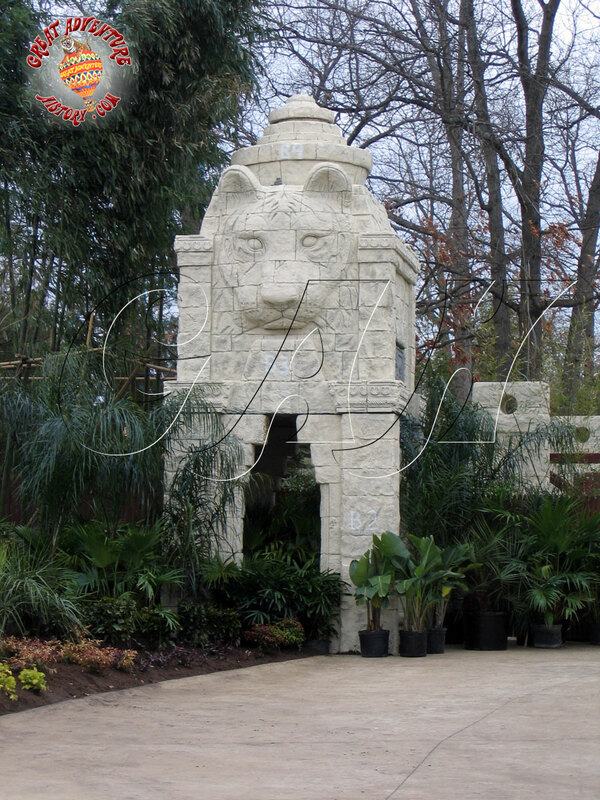 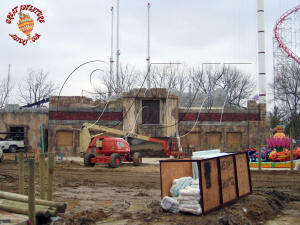 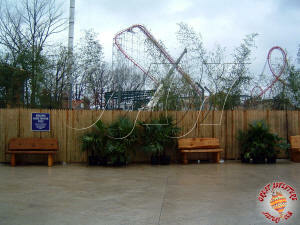 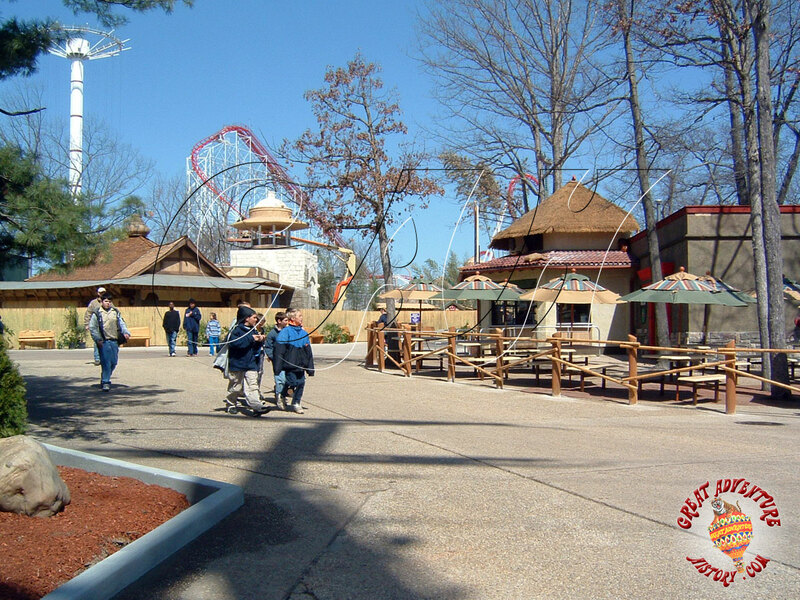 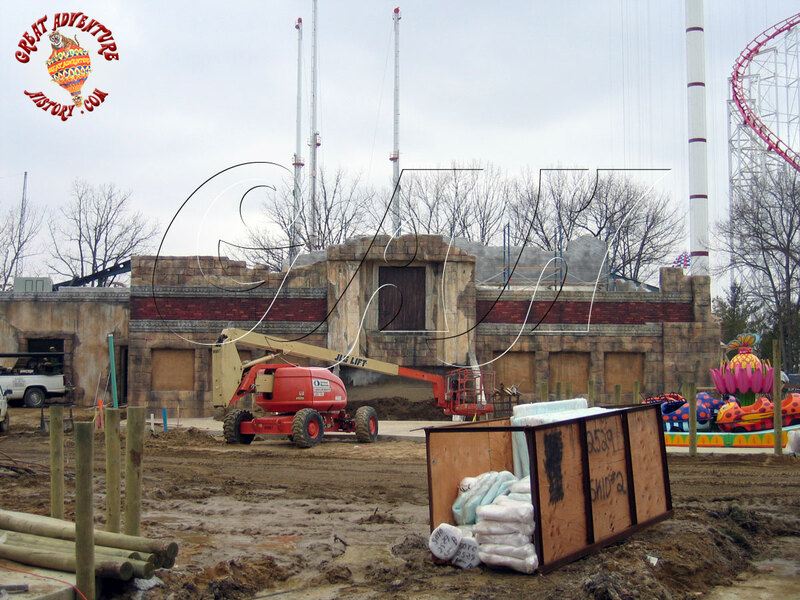 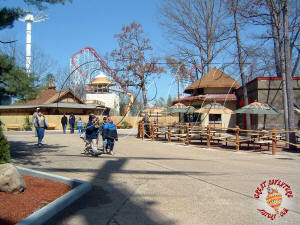 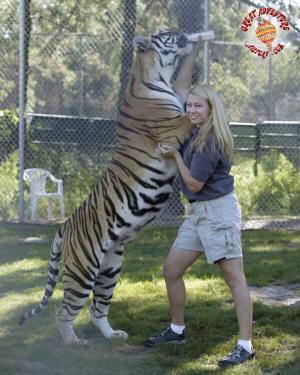 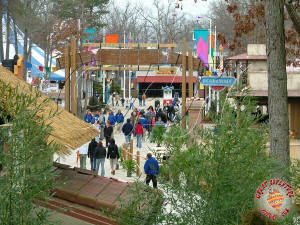 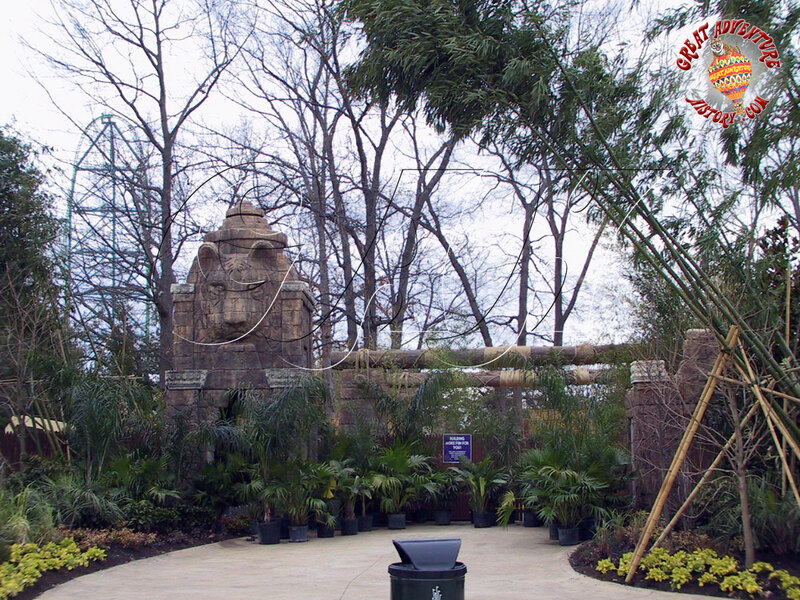 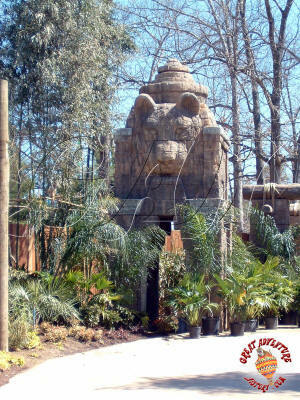 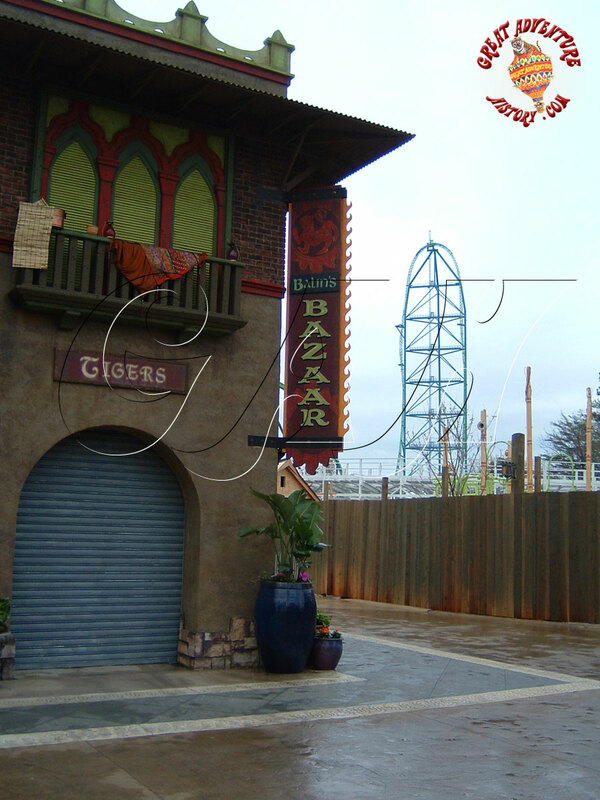 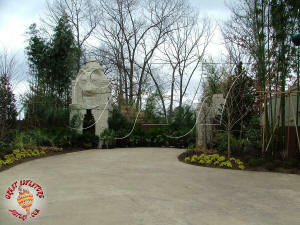 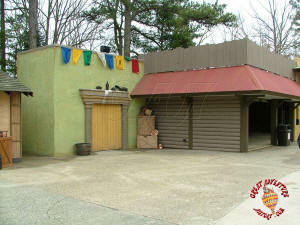 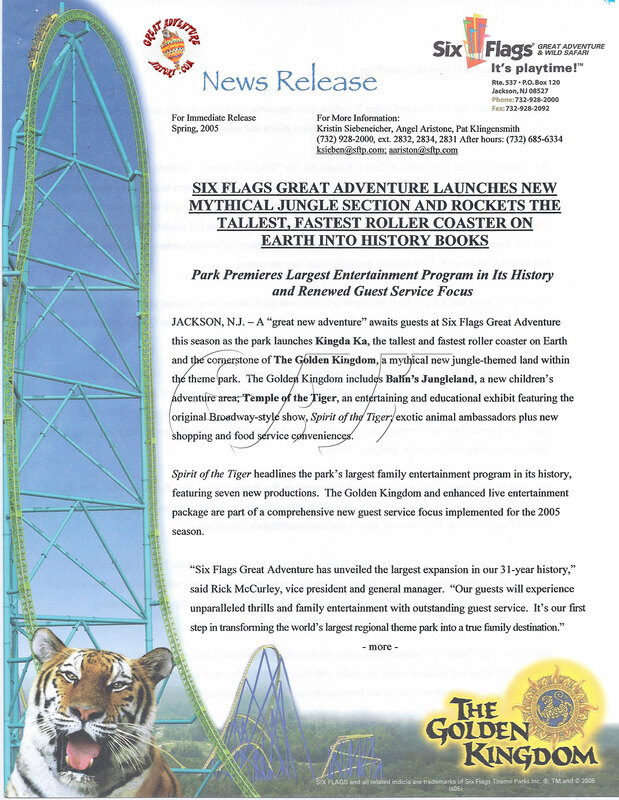 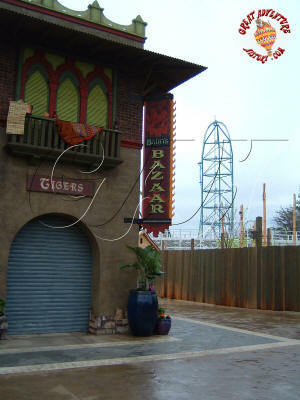 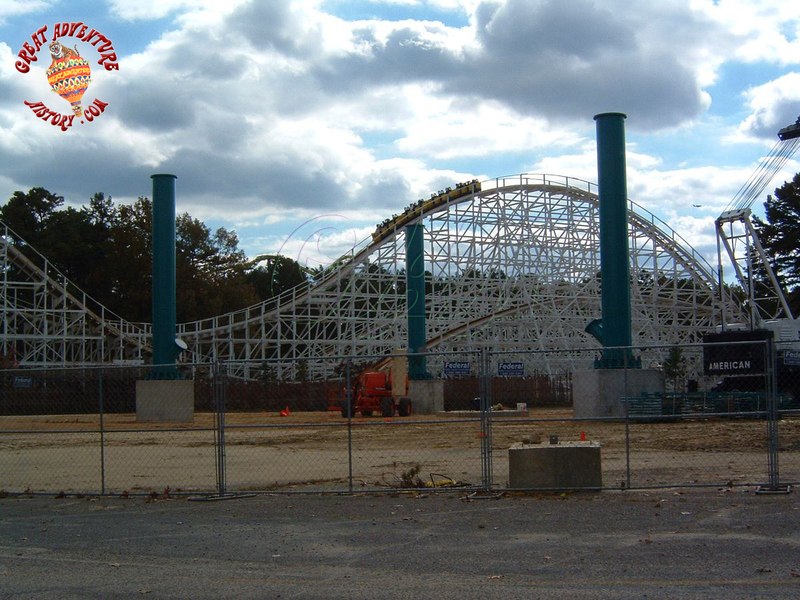 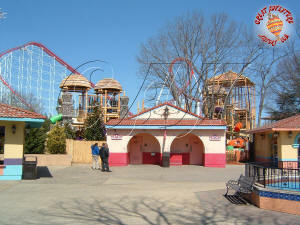 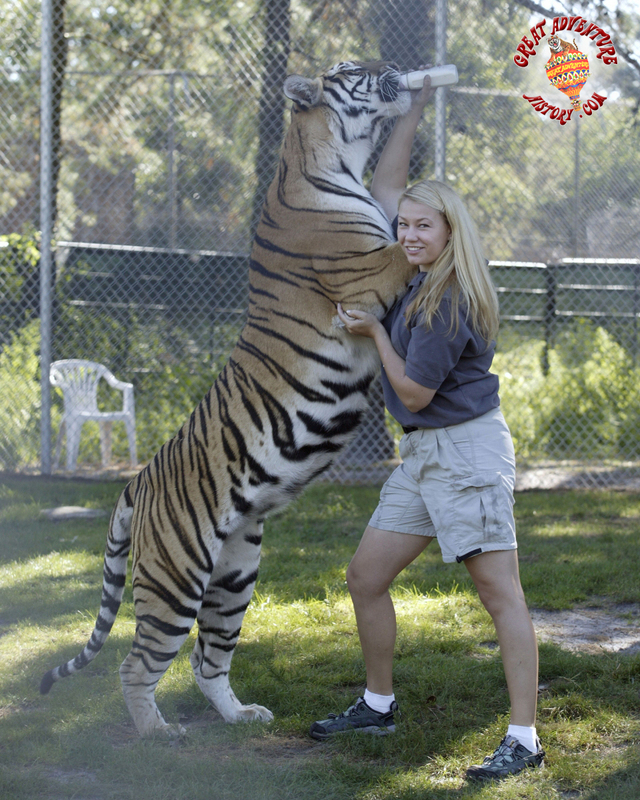 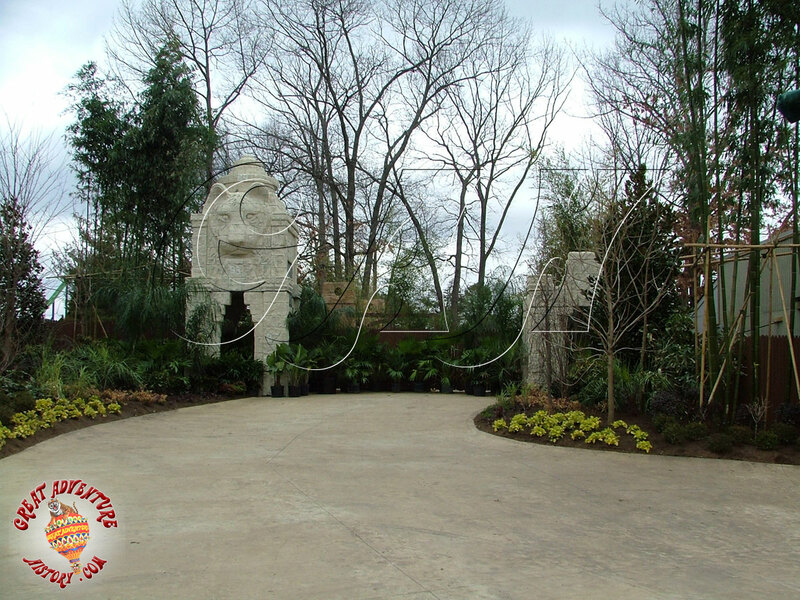 Originally intended to debut in the 2004 season as Tiger Island, the Temple of the Tiger was planned as a more elaborate version of the highly successful show which had been transported from the recently closed Six Flags Worlds of Adventure in Aurora Ohio. 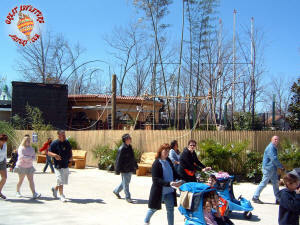 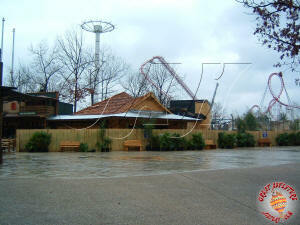 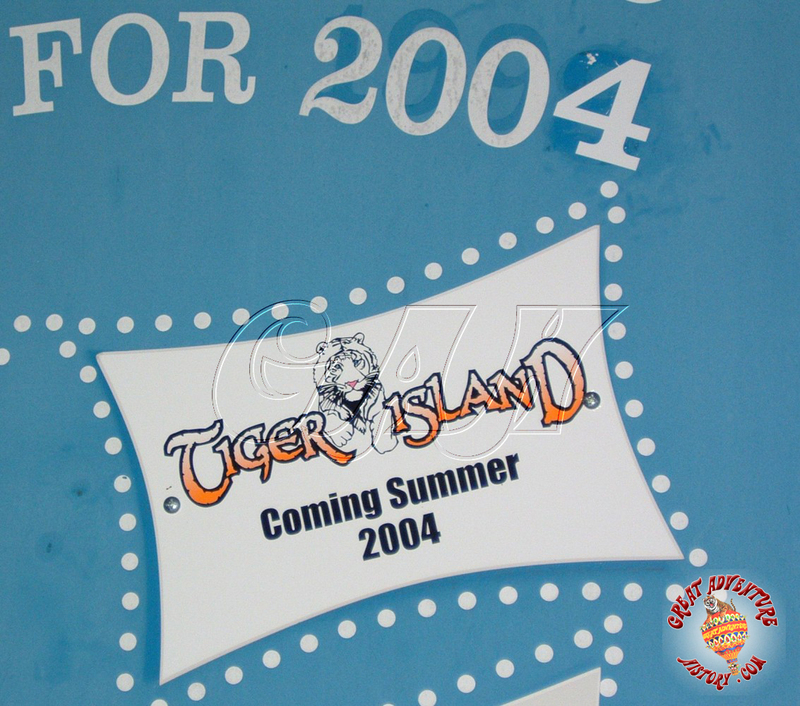 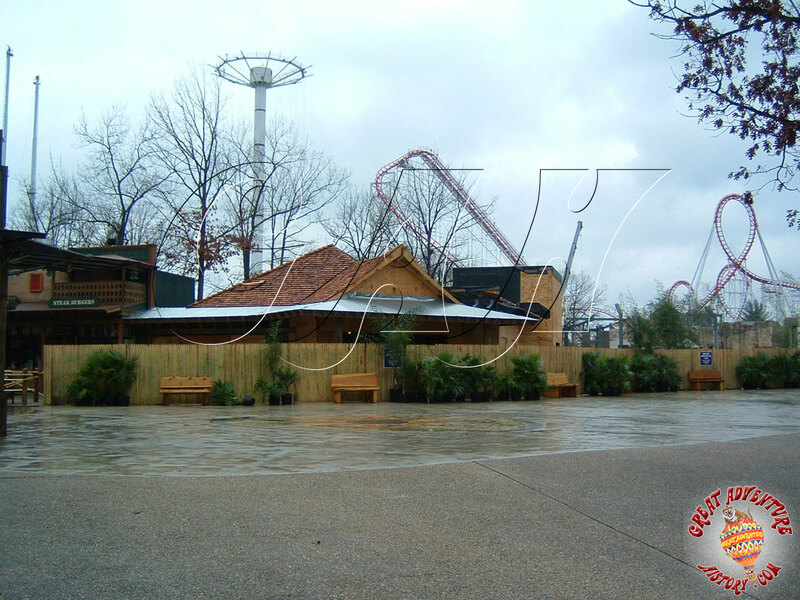 Tiger Island was even posted as “coming soon” during the 2004 season, but as plans for The Golden Kingdom gelled the sign was removed. 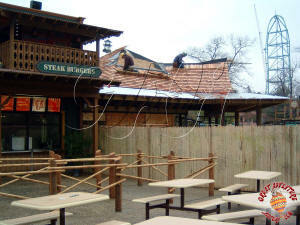 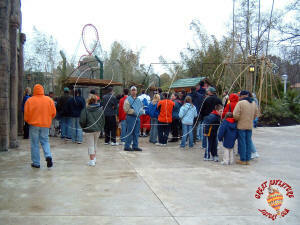 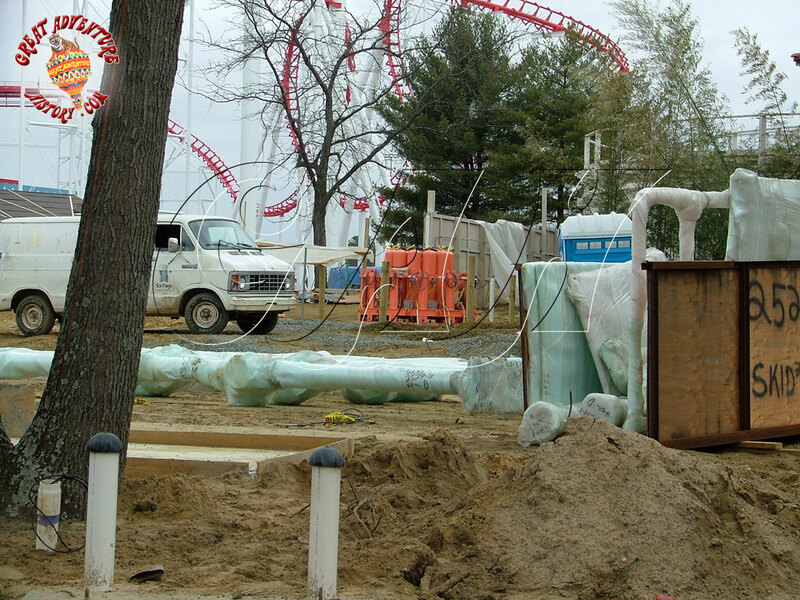 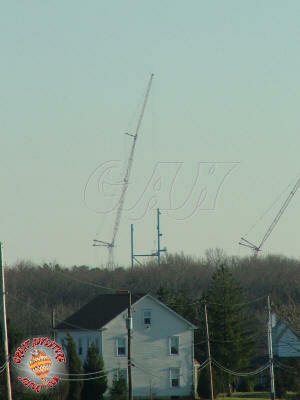 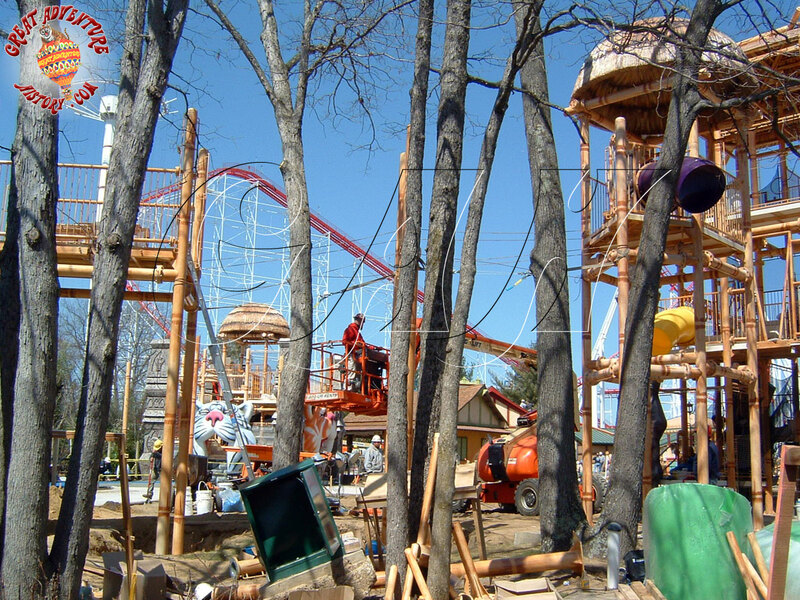 To accommodate construction of the new area, preparations began early in the 2004 season. 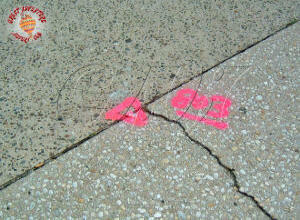 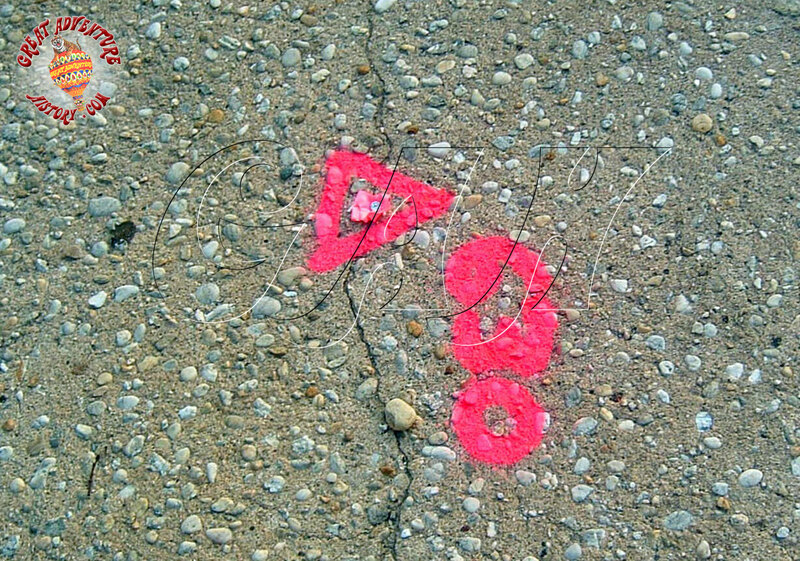 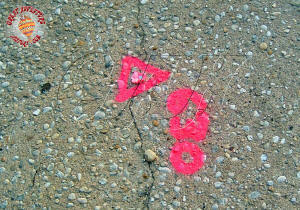 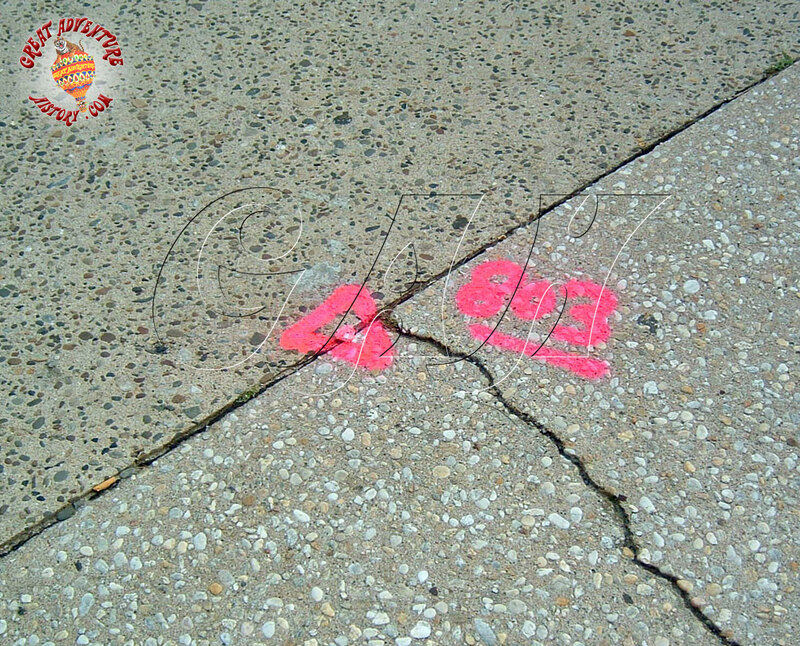 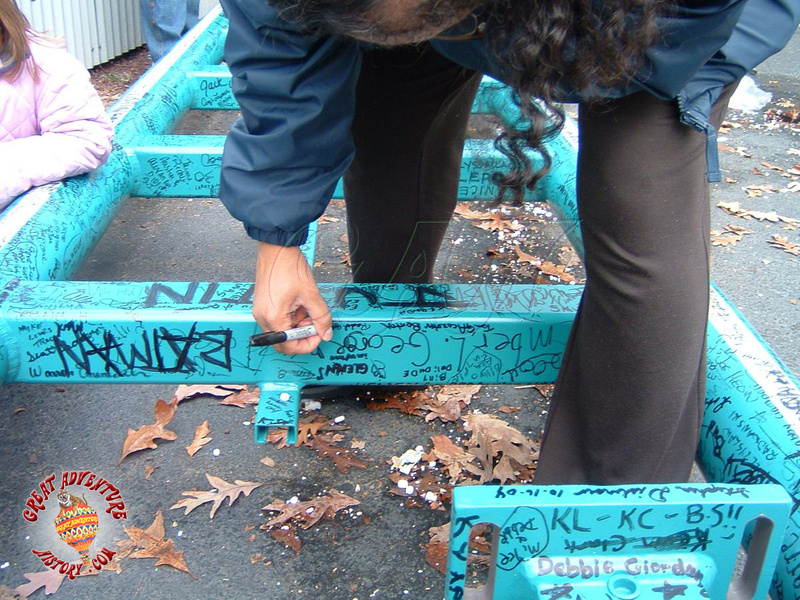 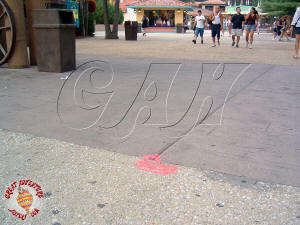 Markings began appearing all over the east end of the park and the adjoining parking lot. 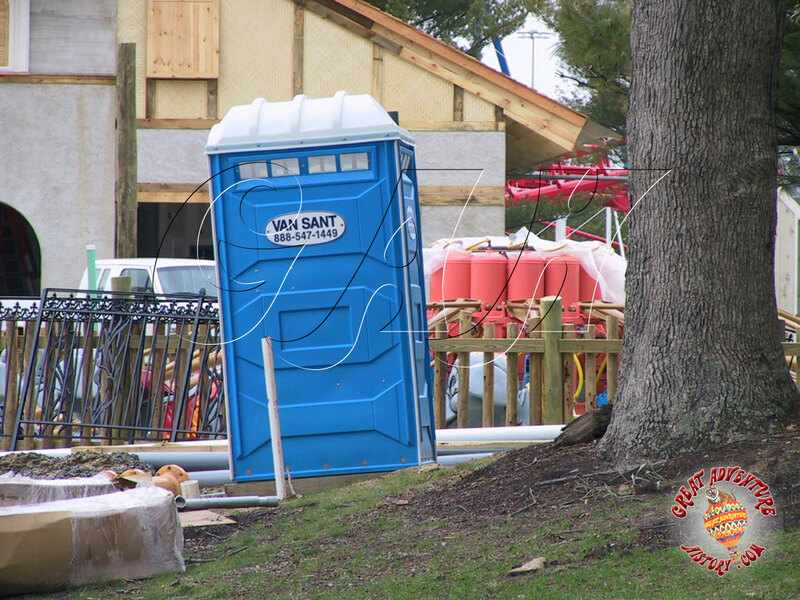 After the expansion won approval from the Jackson Township Planning Board, site prep started with removal of the old Park-A-Pet kennel building in the Safari Hospitality area and the stand of trees around it as this was to become the location of something BIG. 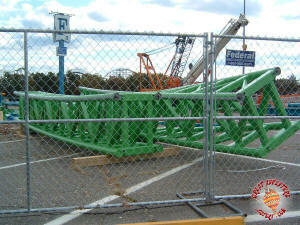 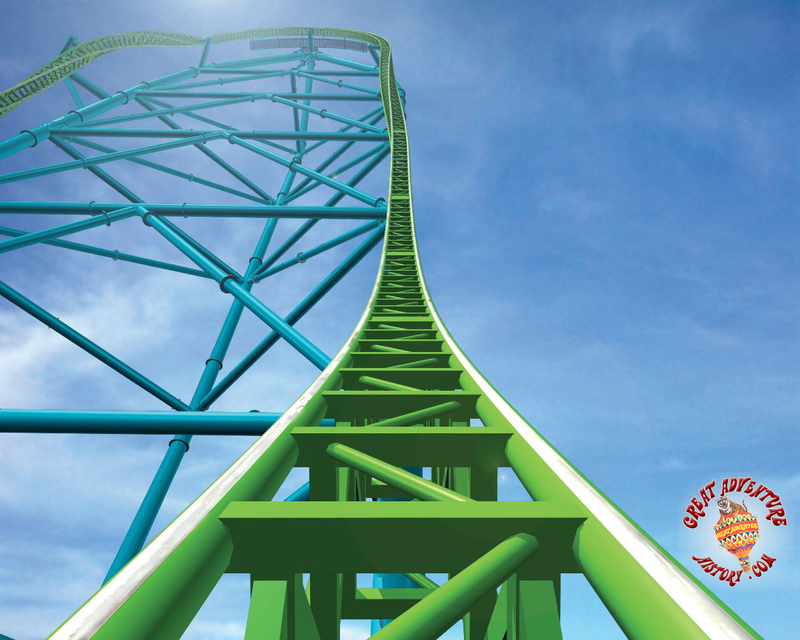 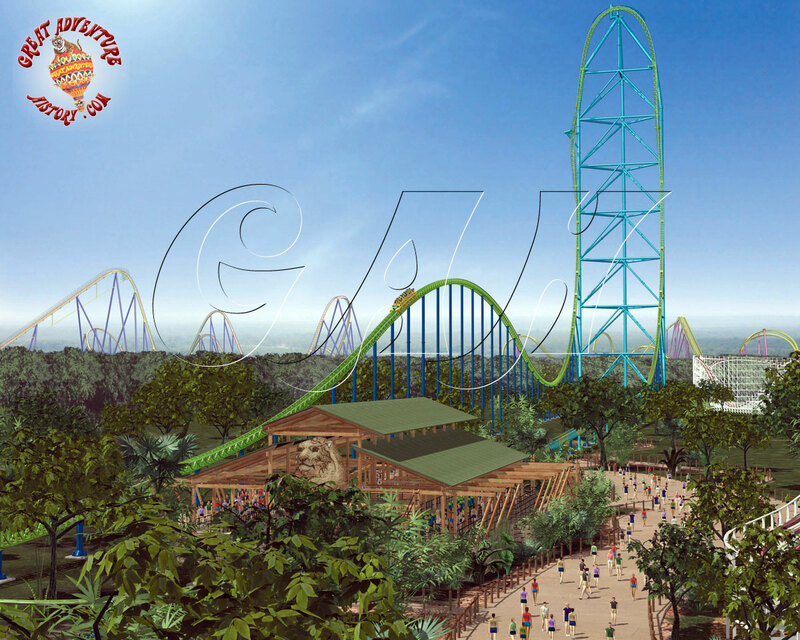 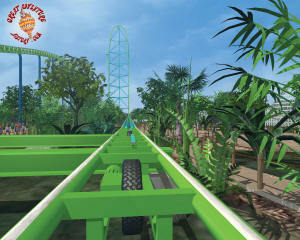 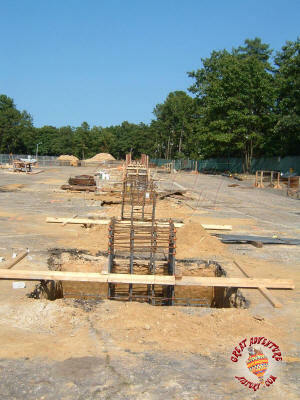 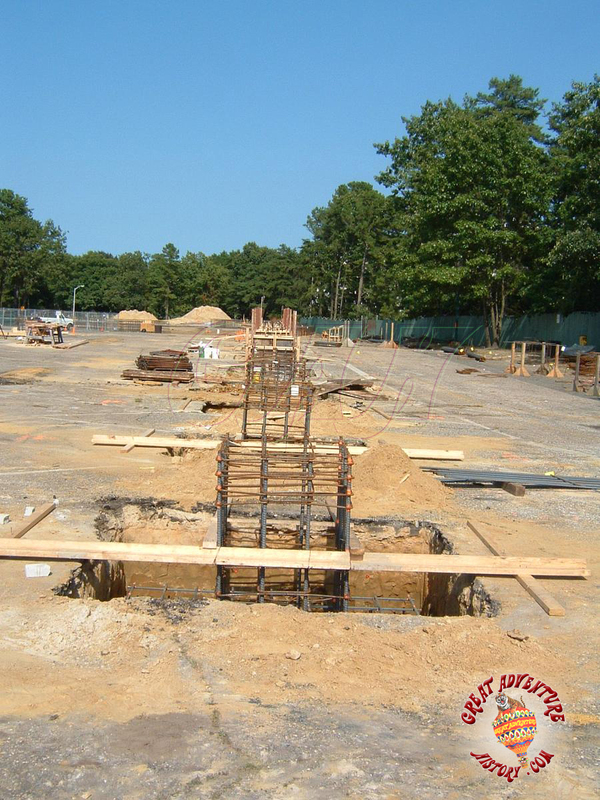 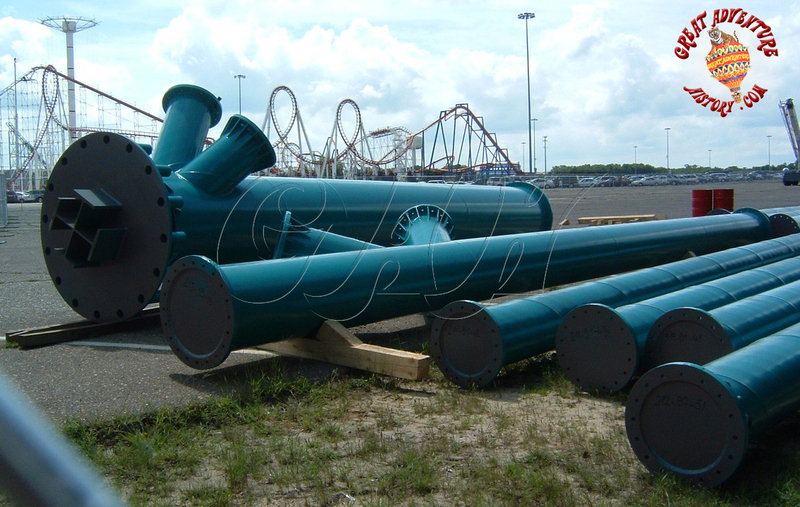 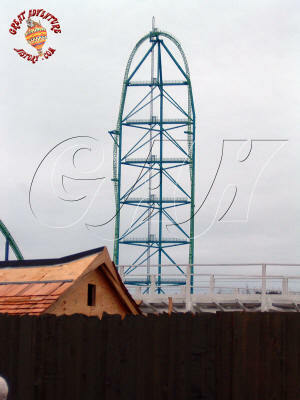 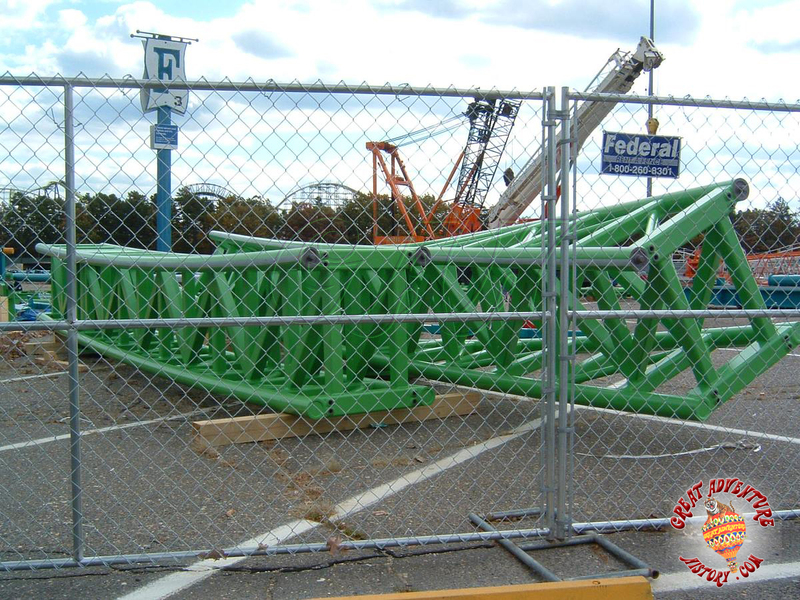 Because of the size of the section’s centerpiece, Kingda Ka, the huge footers for the ride’s tower would take month’s to construct, so excavation had to begin as soon as possible. 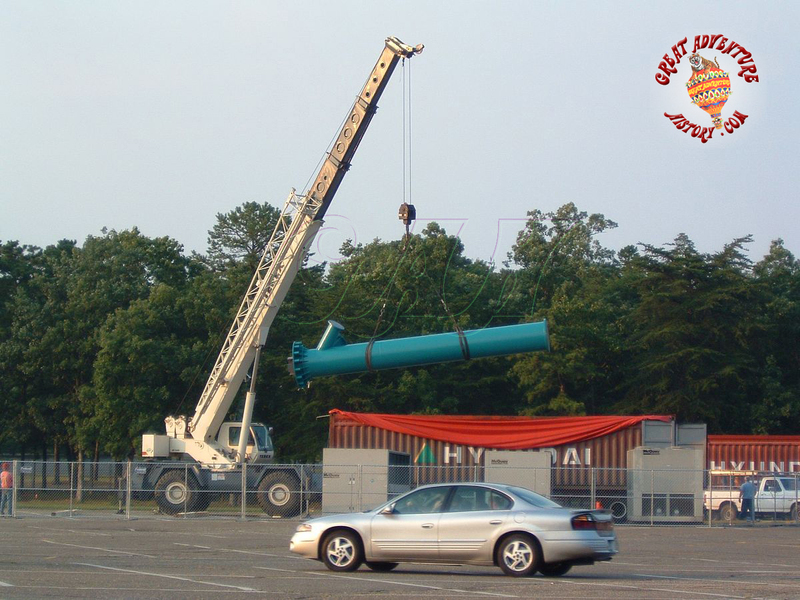 A storage area was setup in the parking lot as the pieces began to arrive from Europe in shipping containers, and guests knew something was coming, just not what. 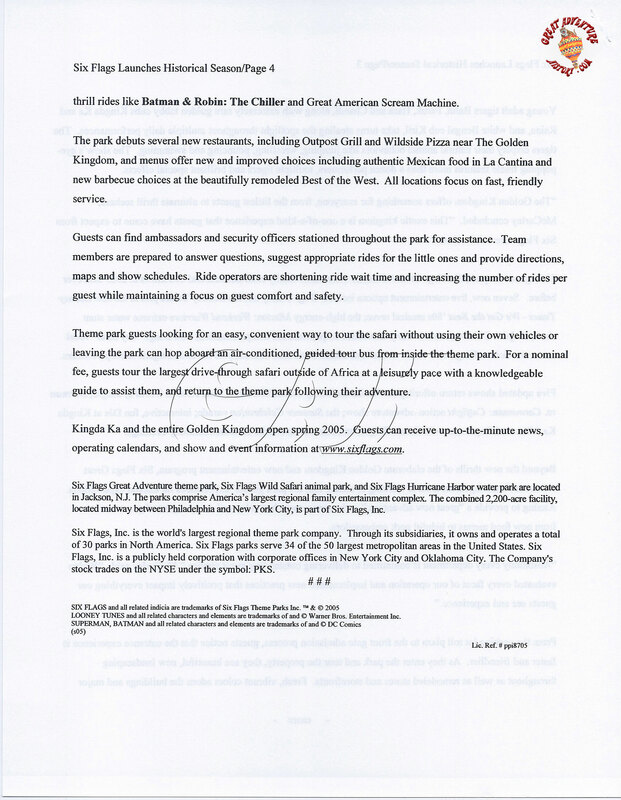 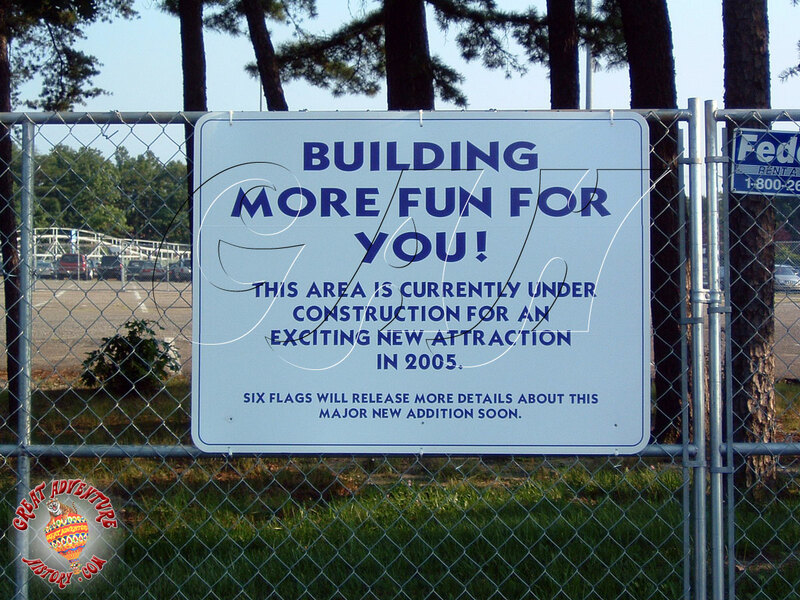 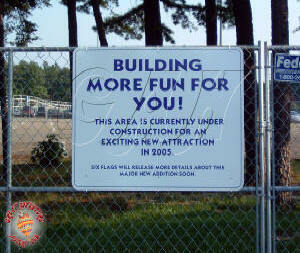 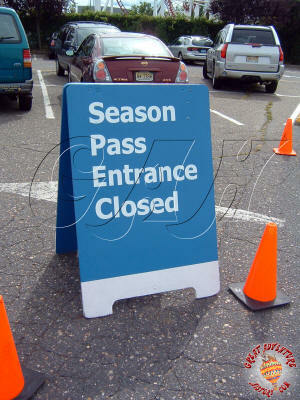 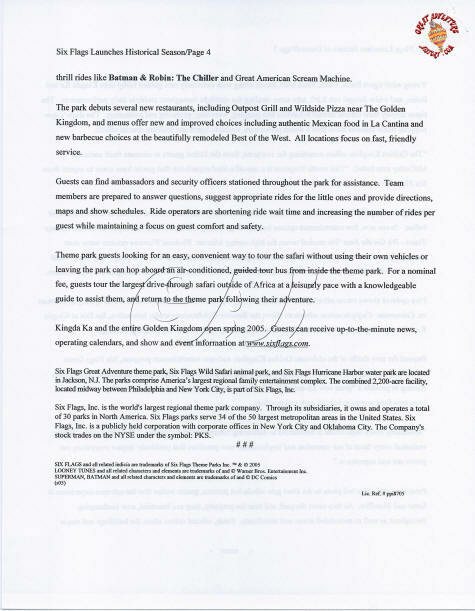 The park’s Season Passholder Entrance was ground zero for the construction, so in August signs went up announcing the closure of the gate while construction was going full tilt on the concrete ride footers all along the edge of the parking lot. 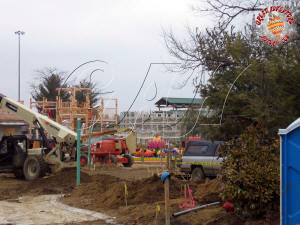 Speculation about the ride coming to the park was fevered with all kinds of wild ideas floating around about the size of the ride and type, with no one guessing that this was much more than just a roller coaster coming to the park. 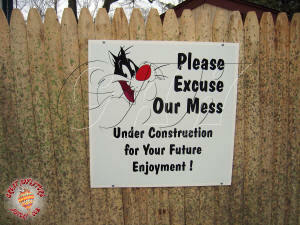 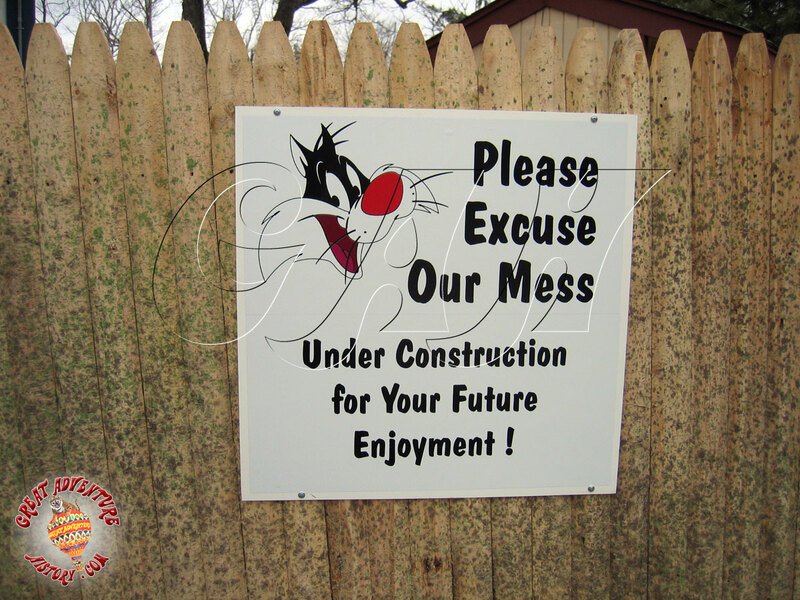 In Bugs Bunny Land signs were placed announcing the children’s area would be closing on Labor Day in order to begin the massive project. 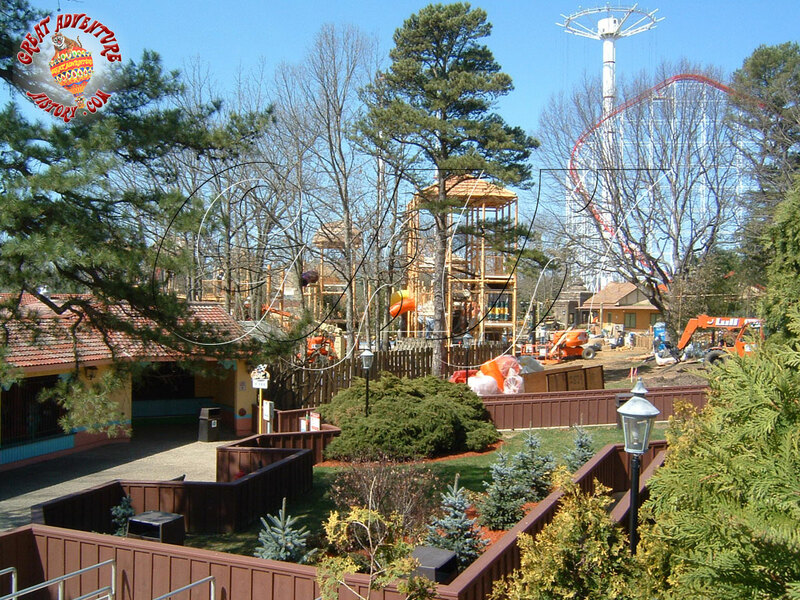 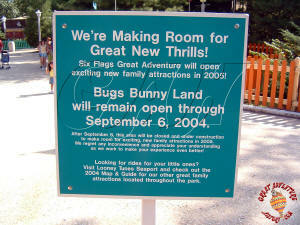 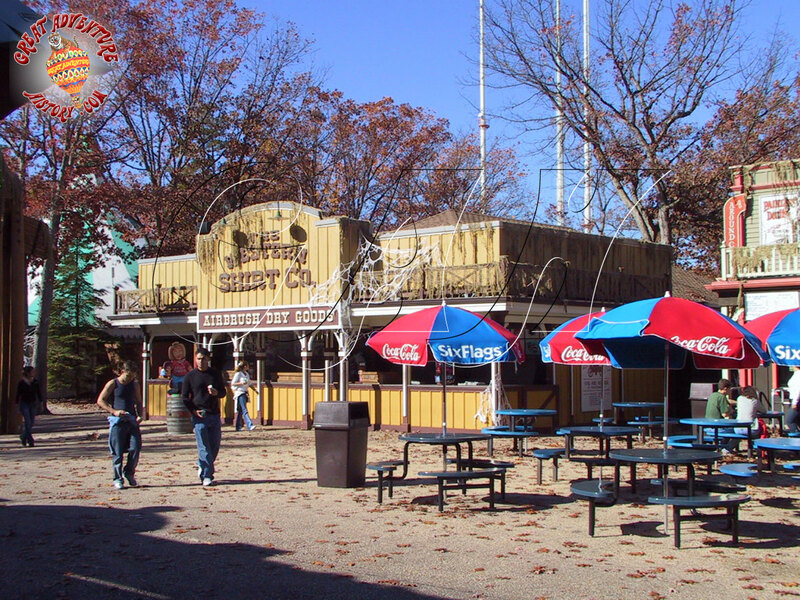 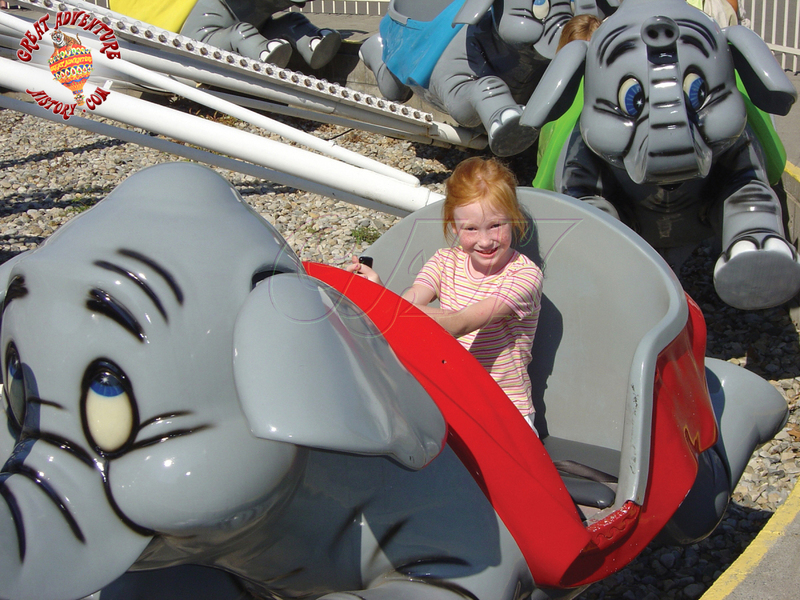 After an outcry from parents, Bugs Bunny Land was granted a reprieve until the end of the season, which resulted in delays in opening The Golden Kingdom in 2005. 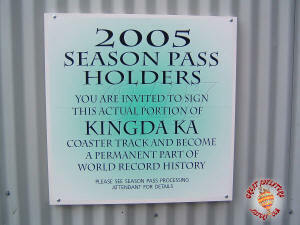 After the park went to weekends only operations in September, final preparations were made for the big announcement which finally came on September 23rd and coincided with the sales of 2005 season passes. 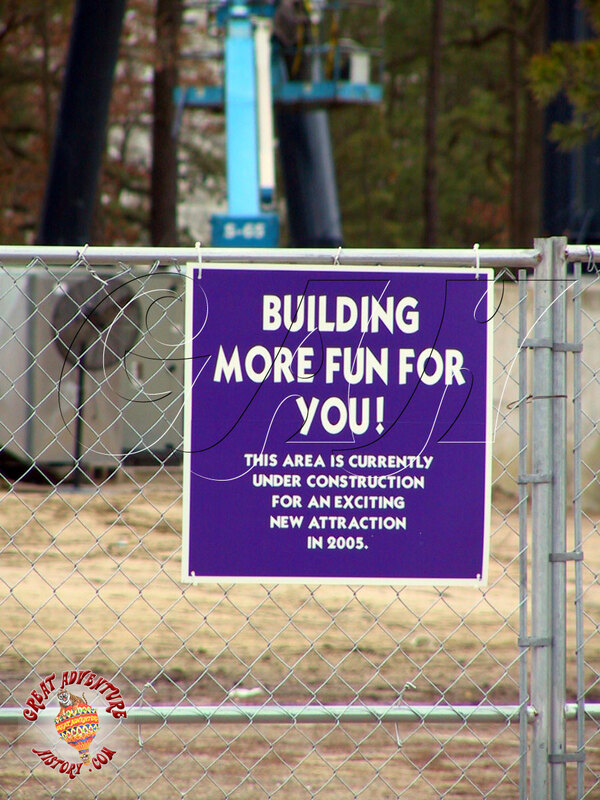 When guests came to the park on Saturday the 24th, signs were everywhere for the amazing announcement of the new Golden Kingdom section and all of the new attractions coming. 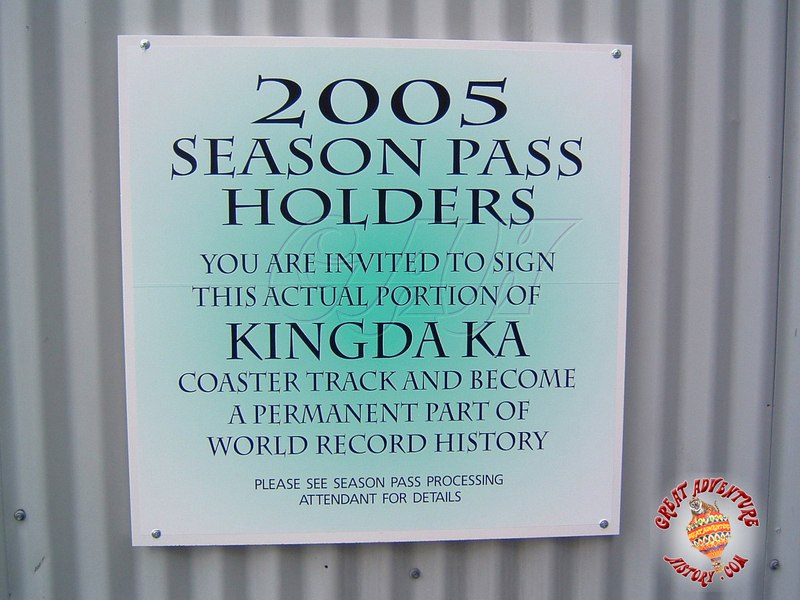 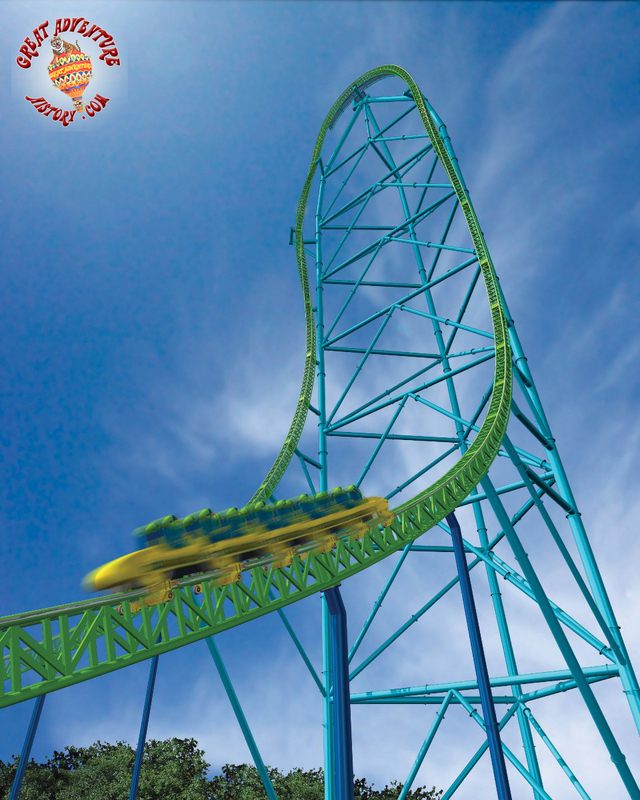 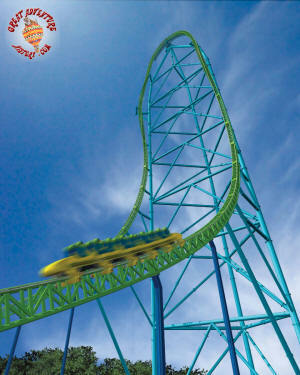 The artwork for the new section was displayed in the Season Pass center just outside the gates which was now The Golden Kingdom preview center, and the animation of Kingda Ka was shown on a continuous loop on the big screen TV inside. 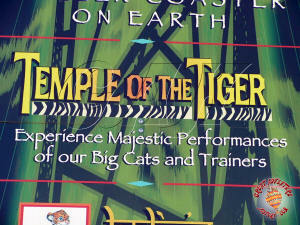 This was the same big screen TV that had been used as a part of the preview of Batman: The Ride in 1992. 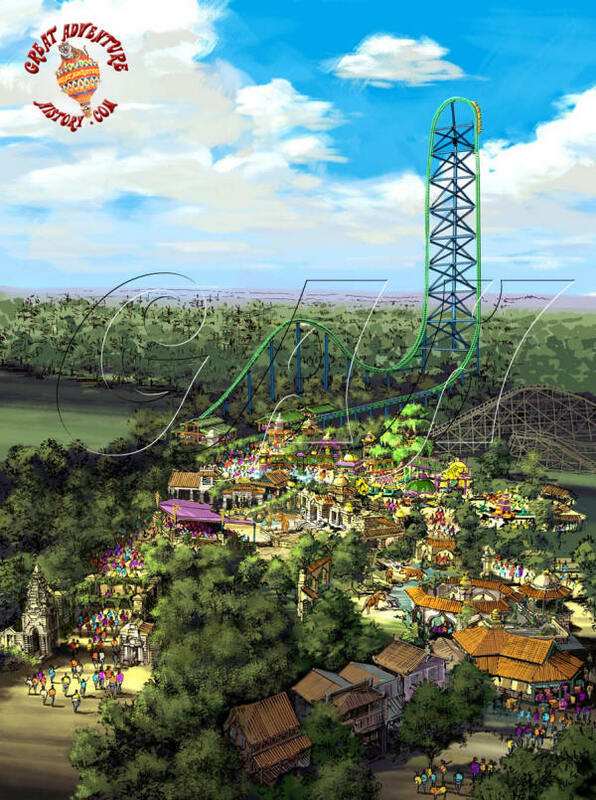 The artwork for The Golden Kingdom really hinted at an amazing concept and lushly themed area, and many guests questioned whether or not Six Flags could pull off something of this scale. 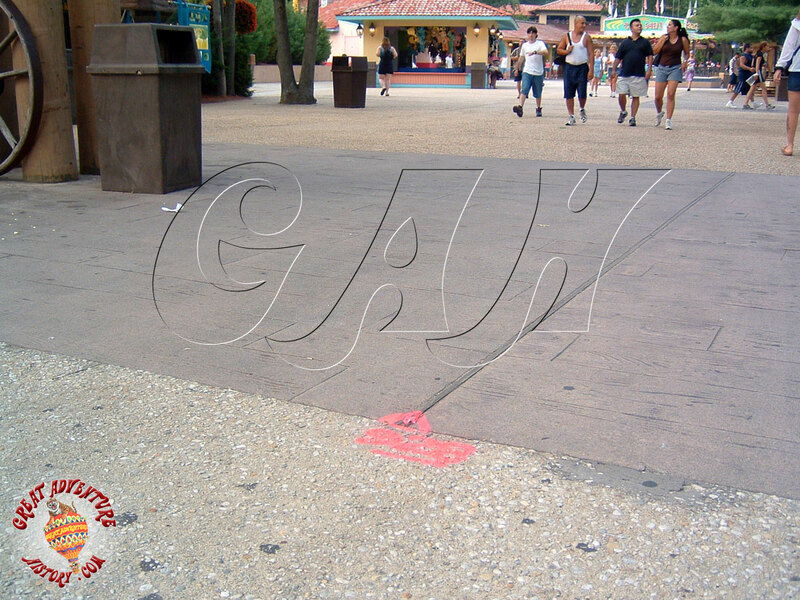 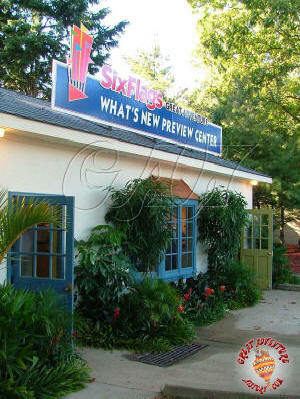 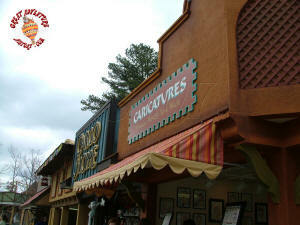 Many had chalked up Six Flags in general and Great Adventure specifically as being more of an amusement park or thrill park than a THEME park since many of the more recent additions to the parks were generic rides with little to no effort made to create a theme for them. 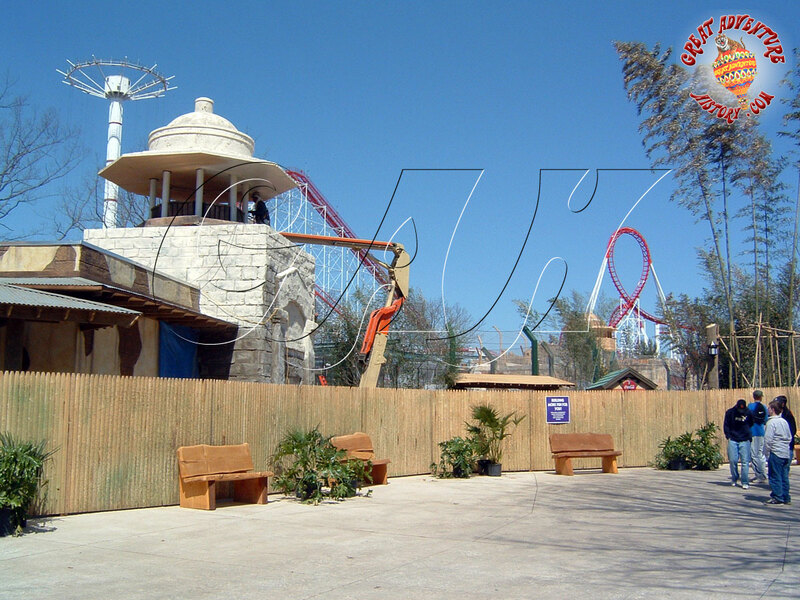 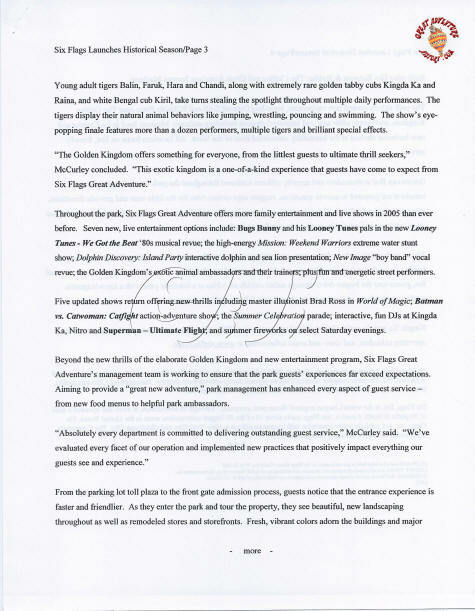 At that point even the efforts made under Time Warner ownership had deteriorated or were stripped away, taking the park back to the non cohesive park that it had been in the 1980’s. 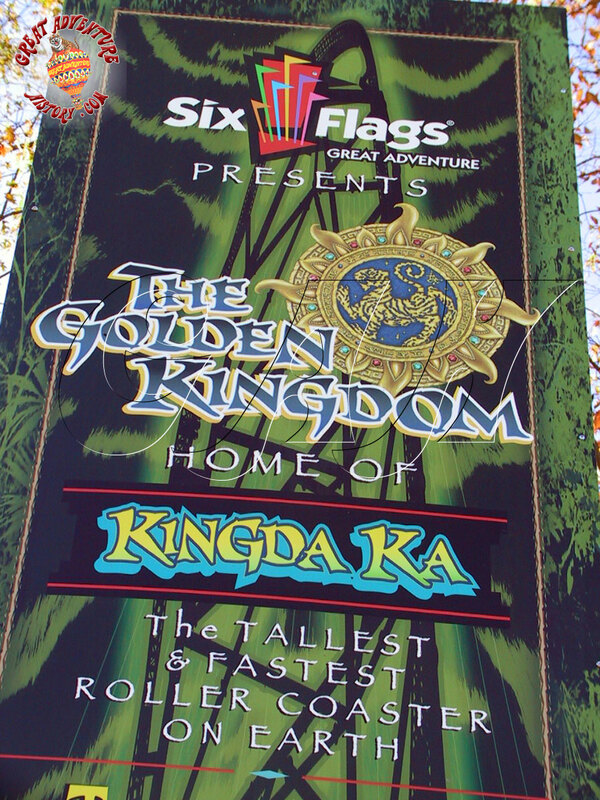 While the artwork created for The Golden Kingdom was evocative, it was scarce on details other than Kingda Ka which had been computer animated in great detail. Over the off-season between 2004-2005 people analyzed in depth every nuance of the artists’ renderings and hoped for more artwork to be released as they impatiently waited for the spring. 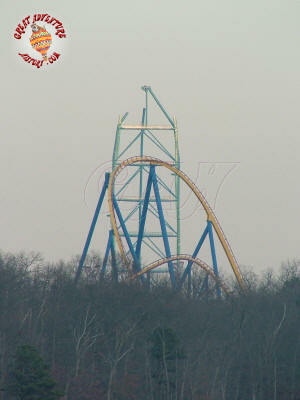 A good number of park fans spent hours at Prospertown Lake Park watching as the massive blue tower of Kingda Ka rose above the trees. 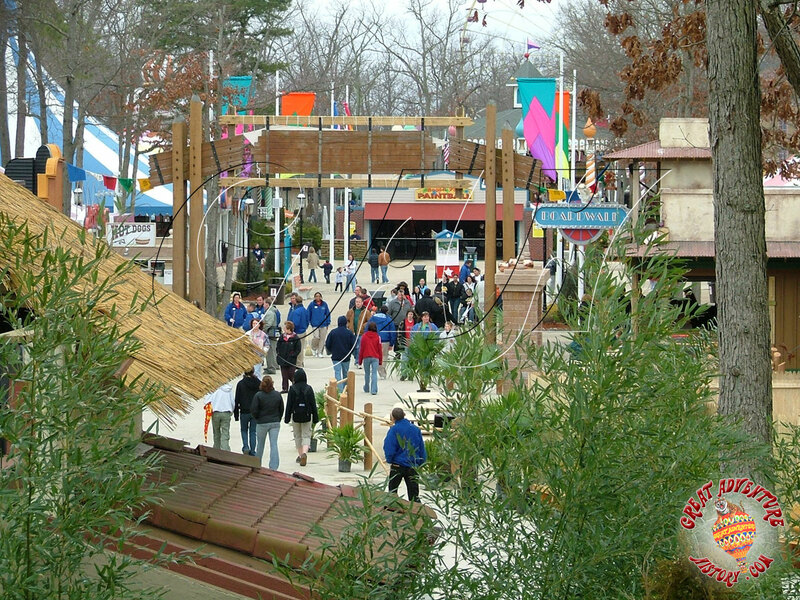 When spring 2005 finally arrived and opening day rolled around, The Golden Kingdom was still under construction, but the area which had been part of Frontier Adventures was nearly complete and the level of detail in the buildings and signs and even the pavement met or exceeded expectations of most guests. 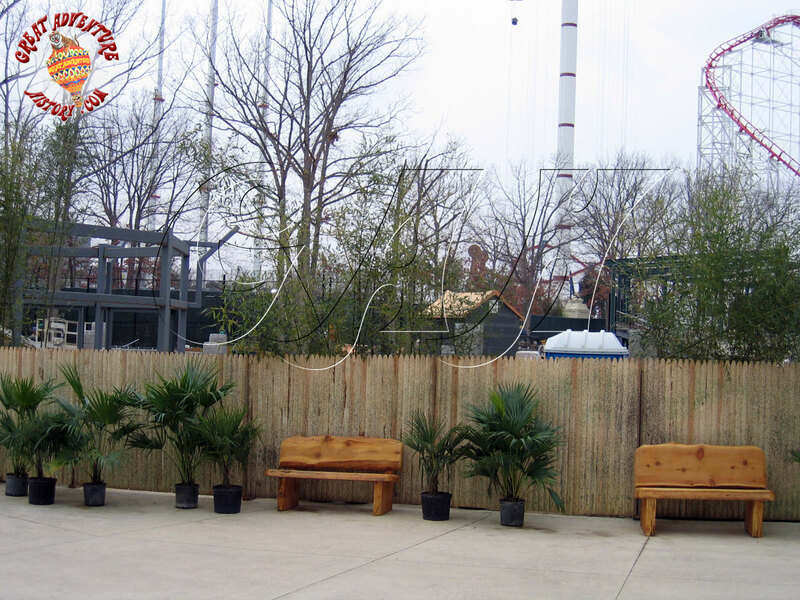 The fenced area still under construction offered tantalizing views of what would be in store once everything was complete. 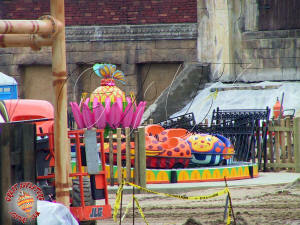 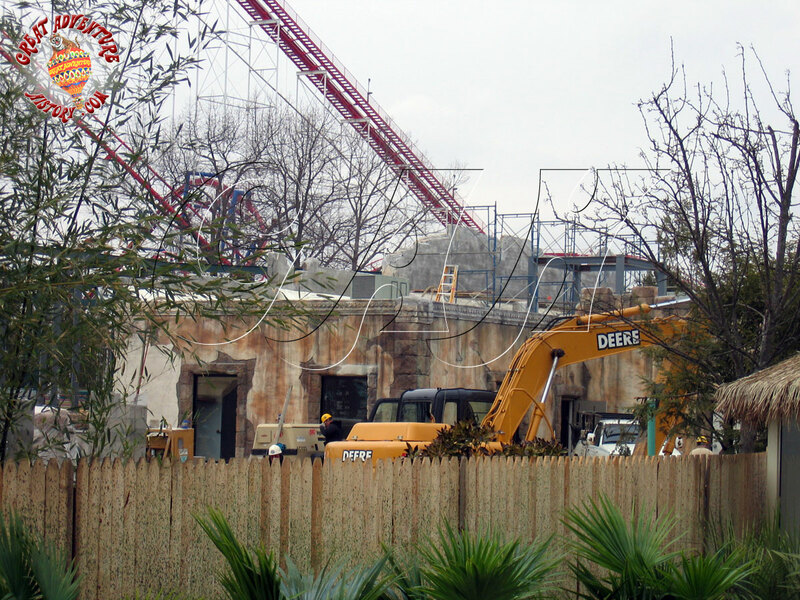 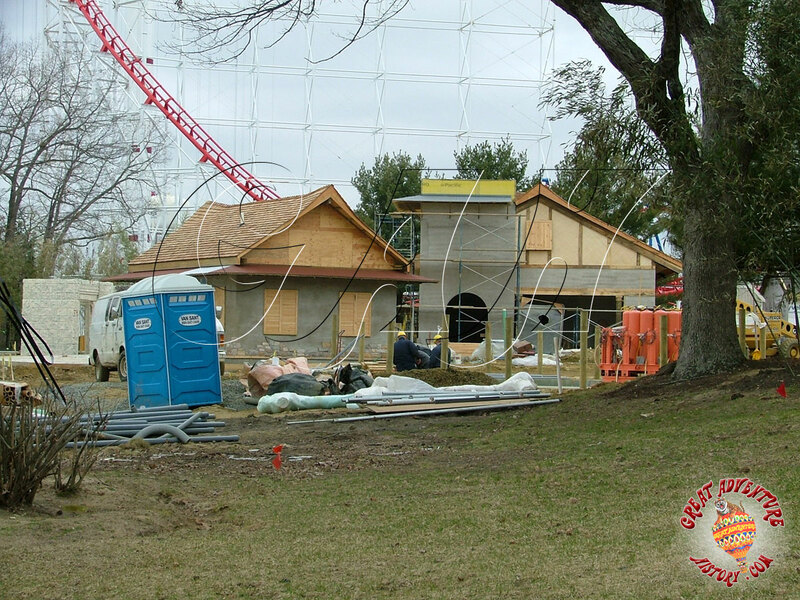 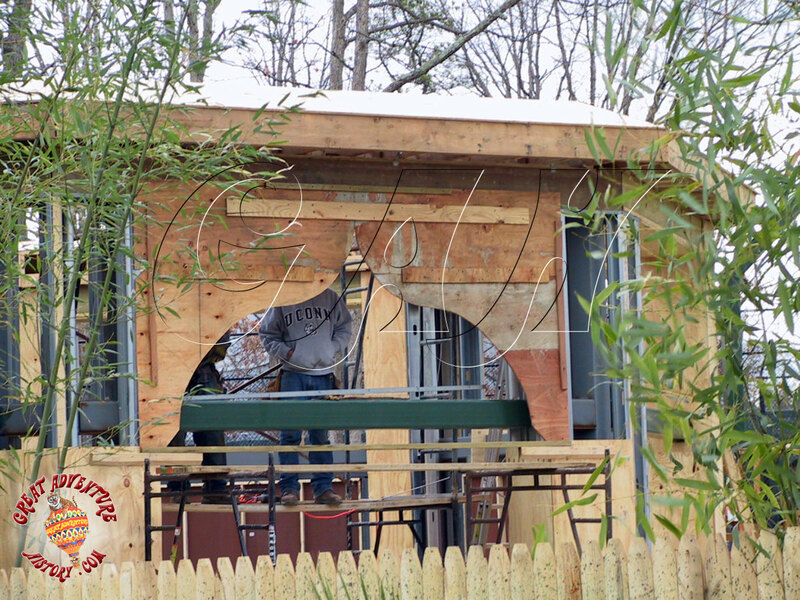 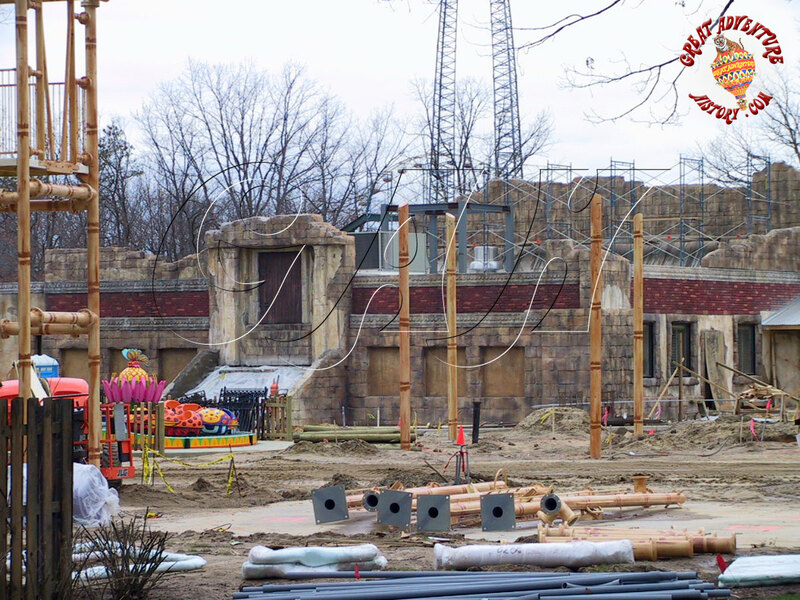 Of course, with the winter being a particularly harsh one, construction was behind schedule and there was much complaining from guests about things not being ready to open with the park’s opening day. 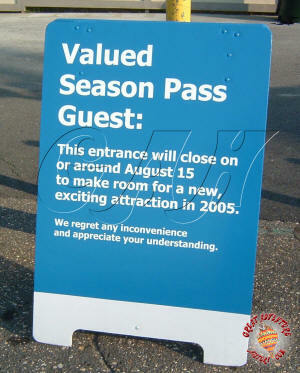 Of course these were many of the same guests who in the fall complained about Bugs Bunny Land closing on Labor Day. 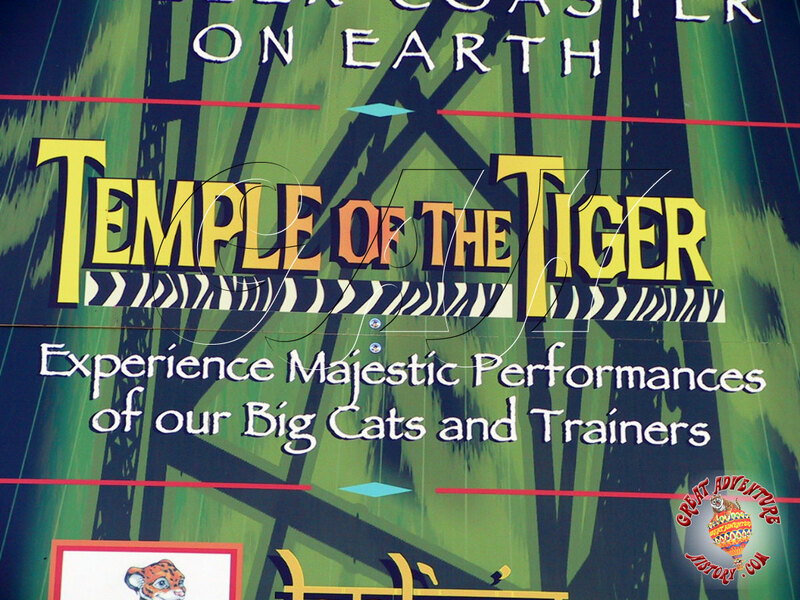 The Temple of the Tiger stadium and animal habitat was really spectacular, creating the look of a ruined temple but housing state of the art facilities for the tigers to live and perform in. 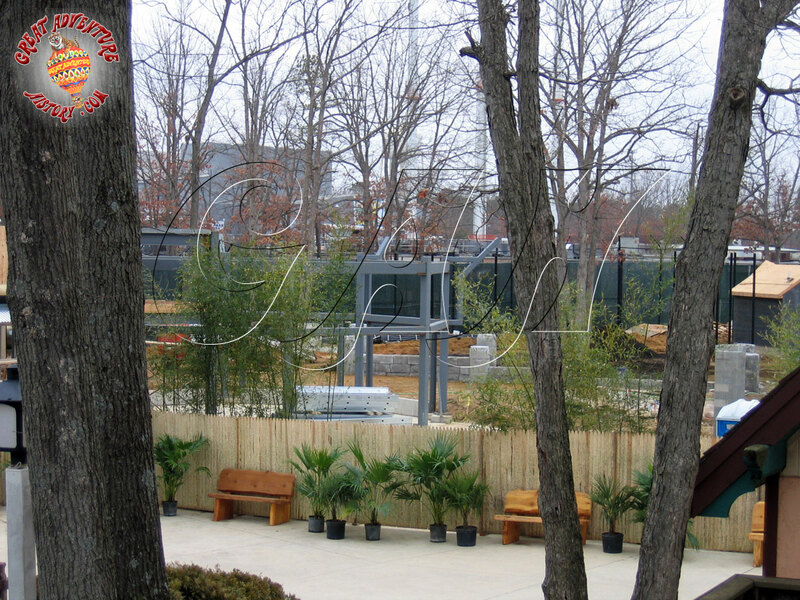 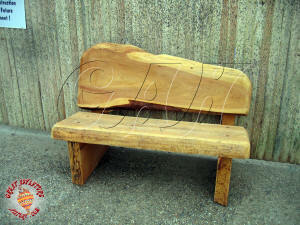 The stadium seating structure was quite simple but would be generally unseen by the public behind the building and stage area. 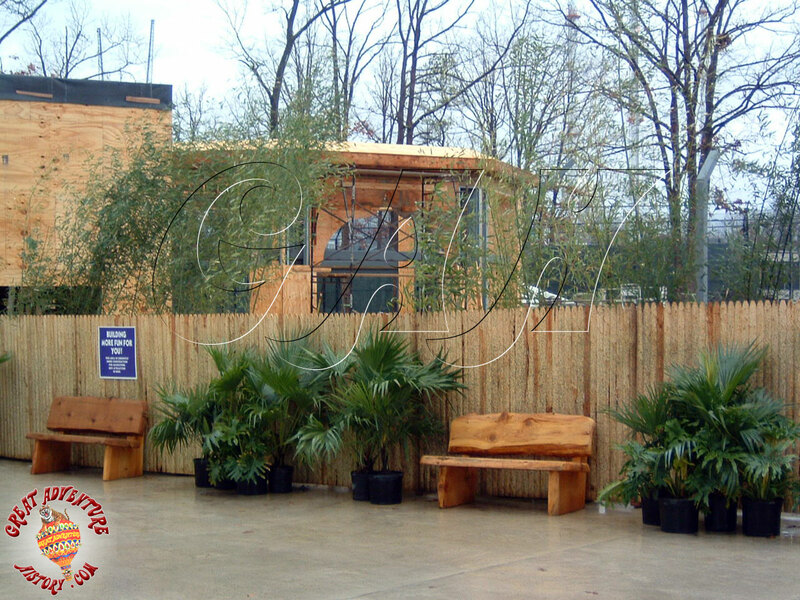 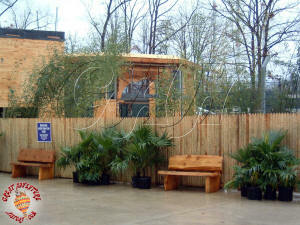 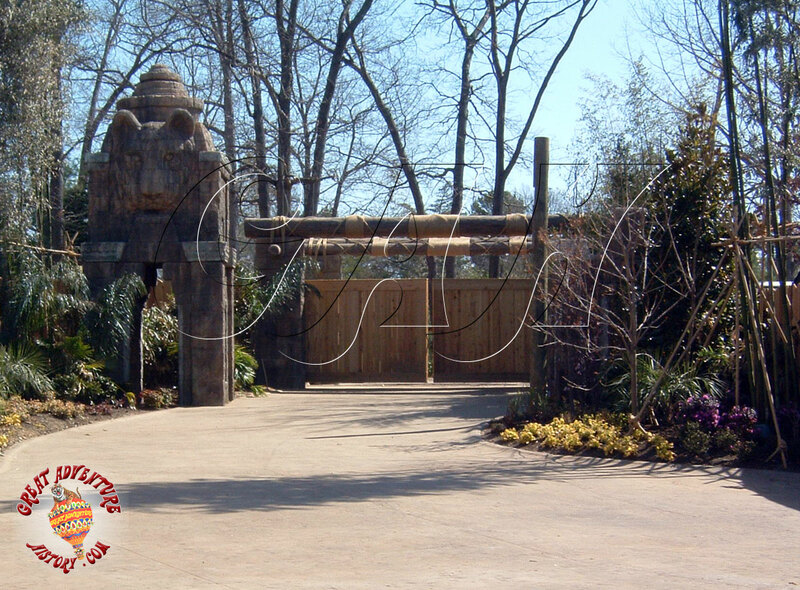 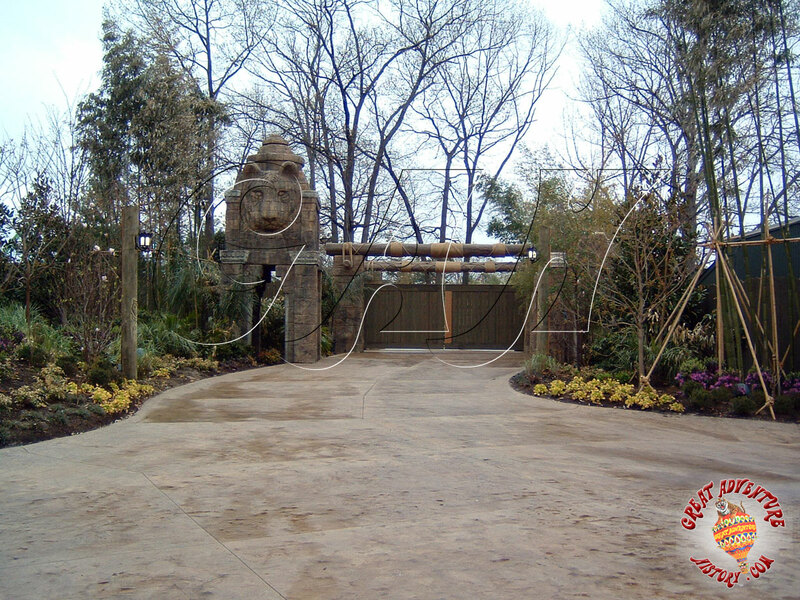 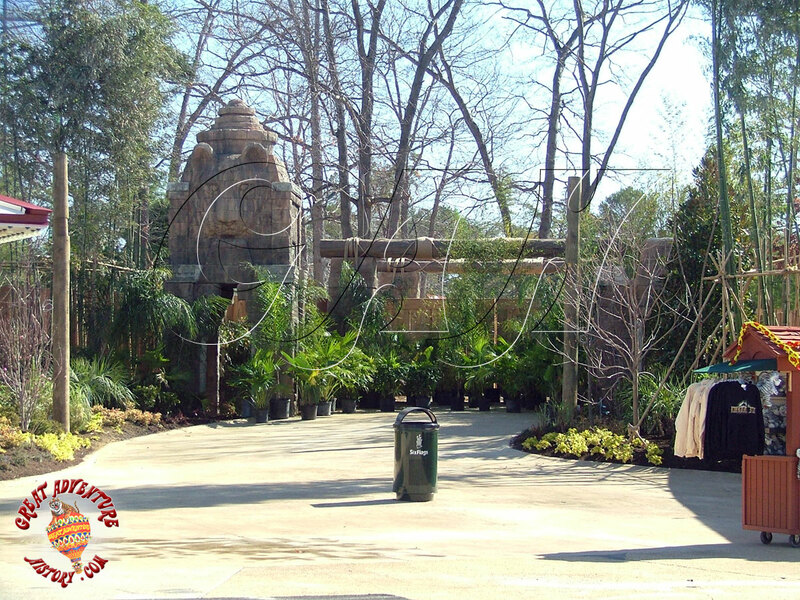 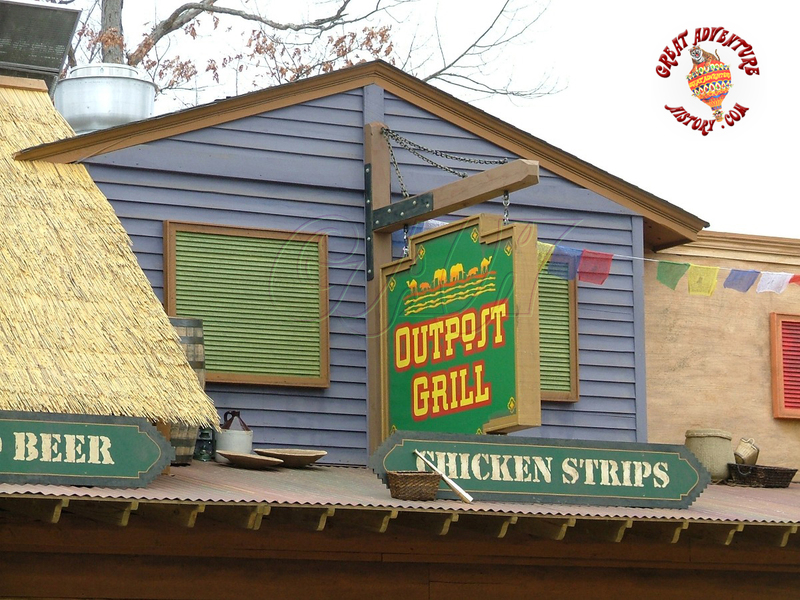 The yards where the tigers would go out between shows were the latest in zoo design with windows allowing guests to get close to the animals safely but set in rustic arched frames that rivaled the theme elements in Disney parks. Taking some of the existing structures and incorporating them into the new Golden Kingdom was an interesting task. 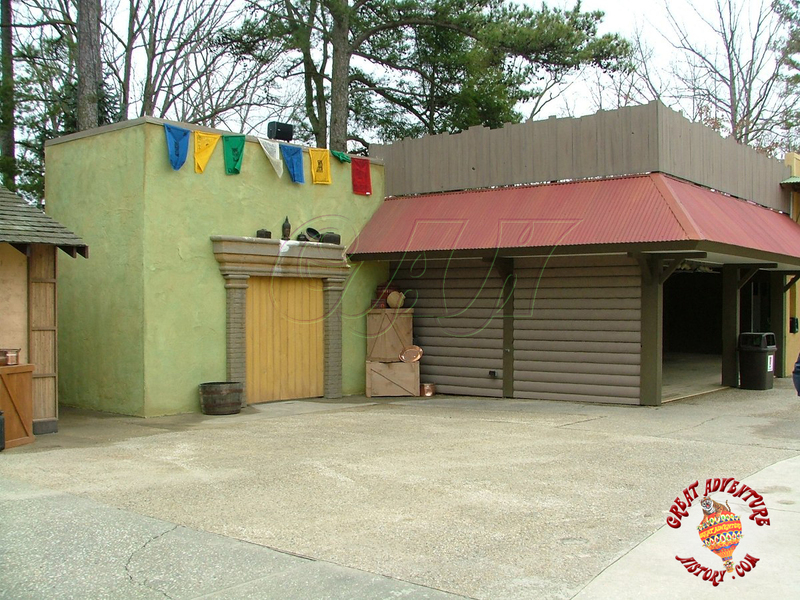 The buildings that had been part of Frontier Adventures really just got updated facades with new colors and lots of little ornamentation added to them. 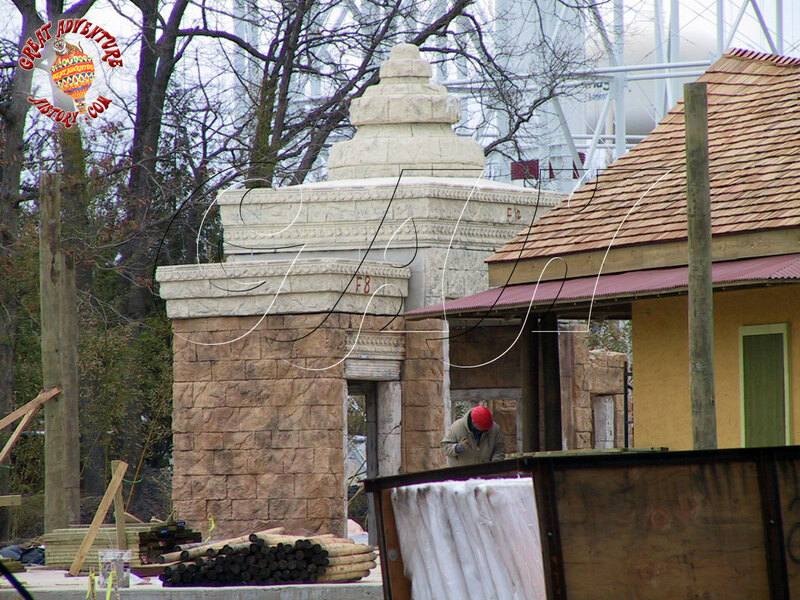 Even the Frontier Adventure portal was repurposed with the new Golden Kingdom name added to it along with carvings being added to the posts which matched the carved light posts which were being placed throughout The Golden Kingdom. 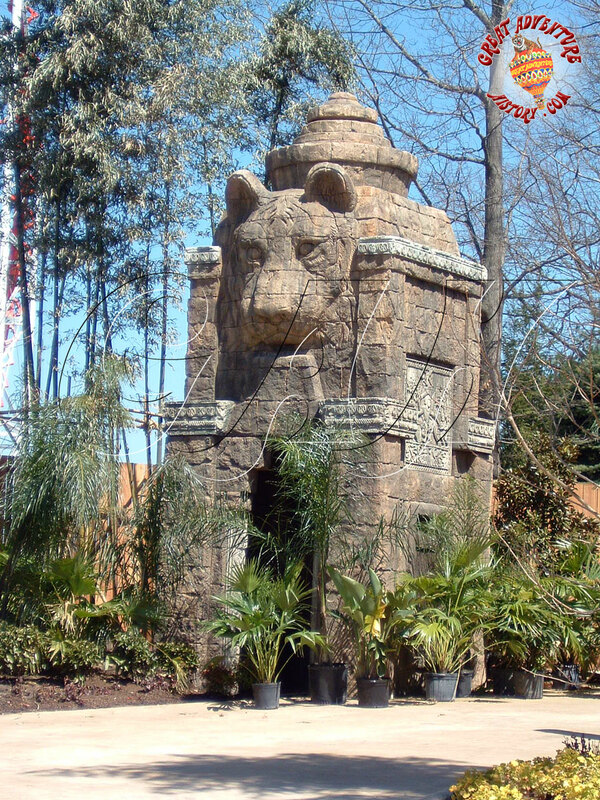 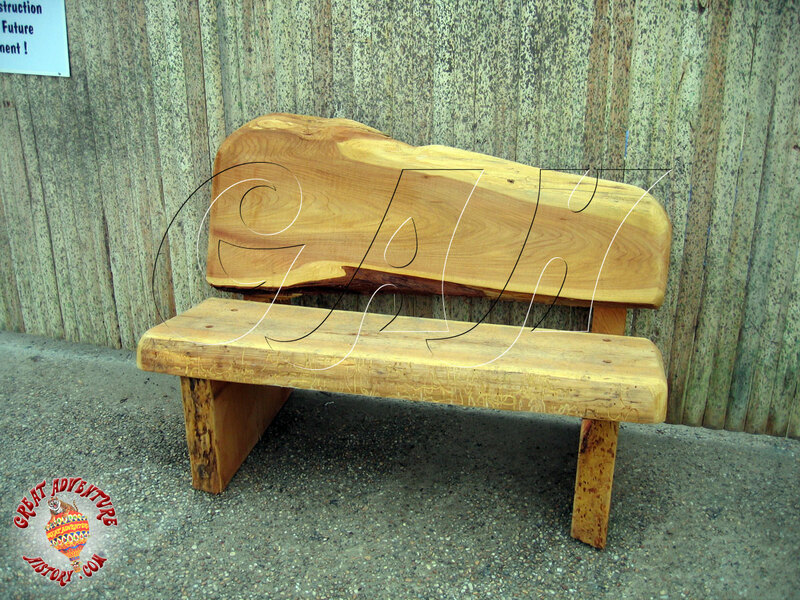 Each carving was unique which made The Golden Kingdom a place where guests would find something new and unique in every corner. 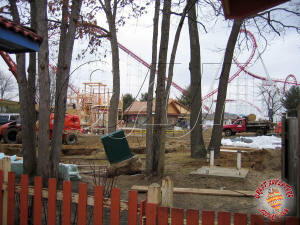 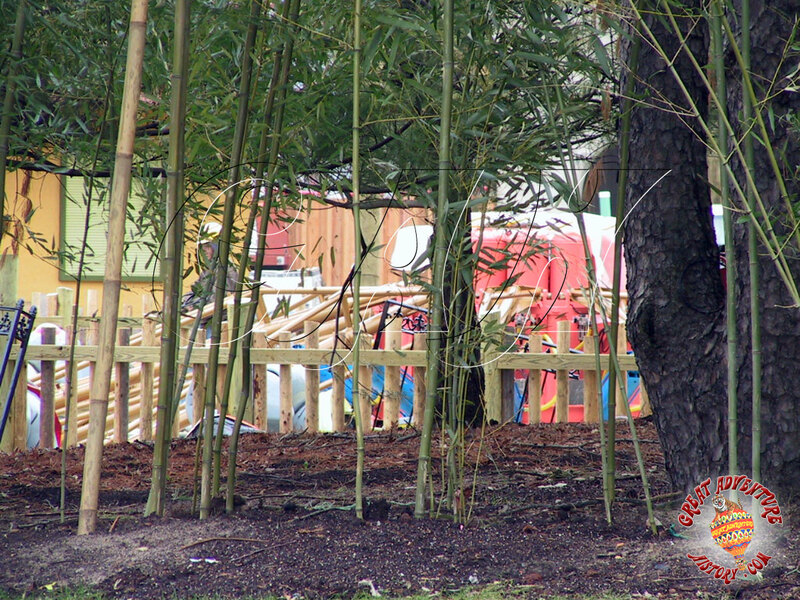 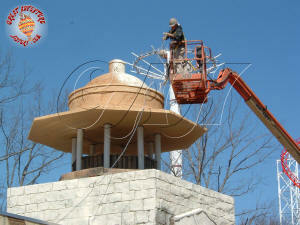 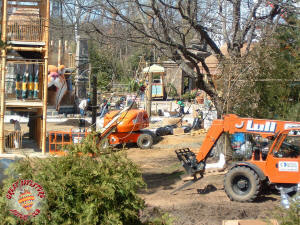 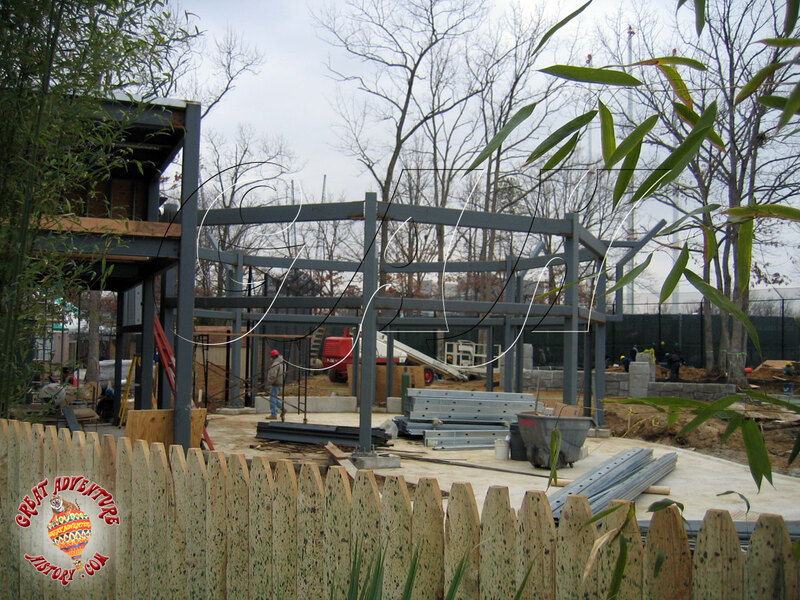 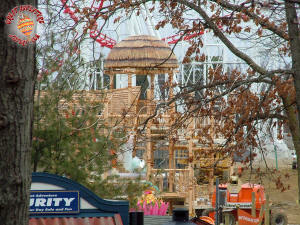 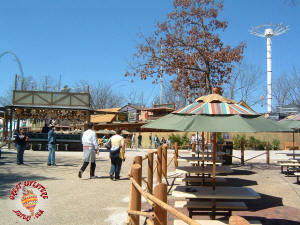 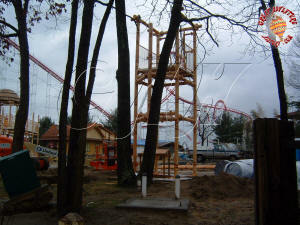 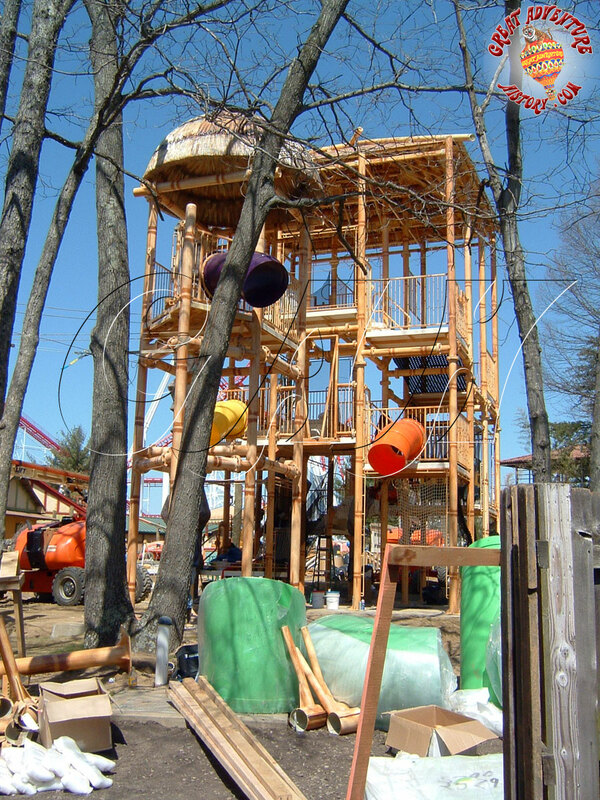 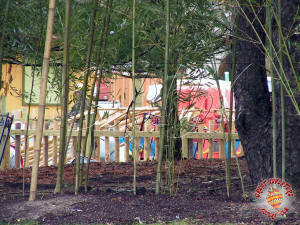 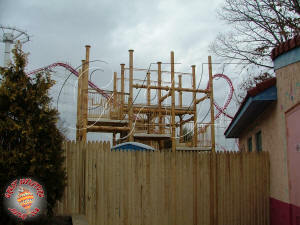 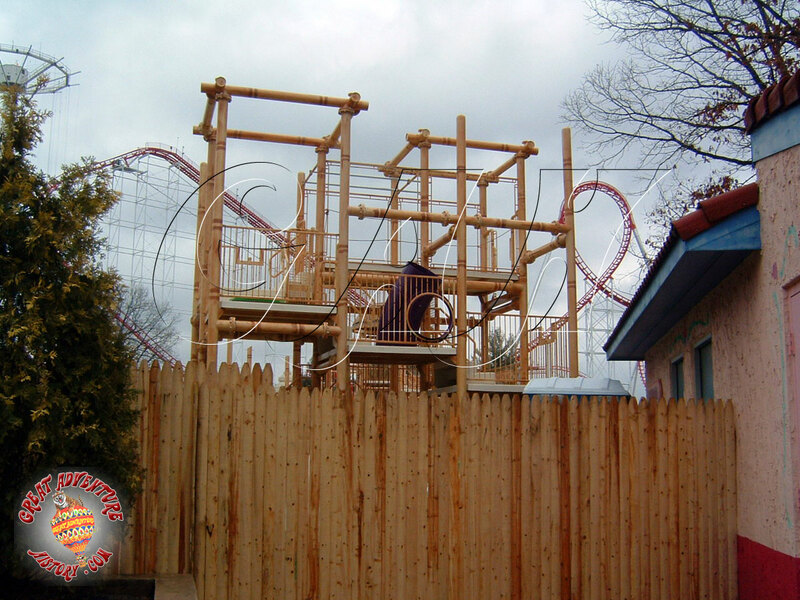 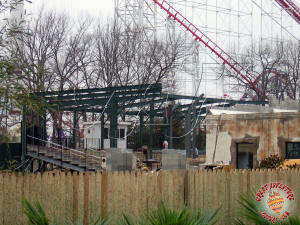 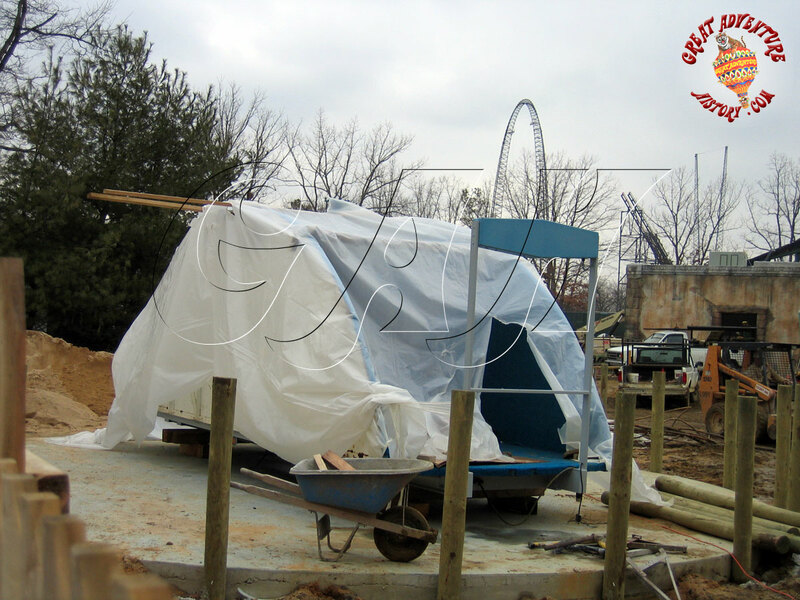 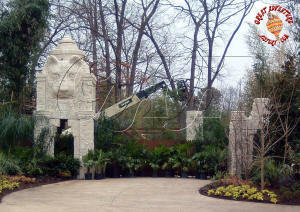 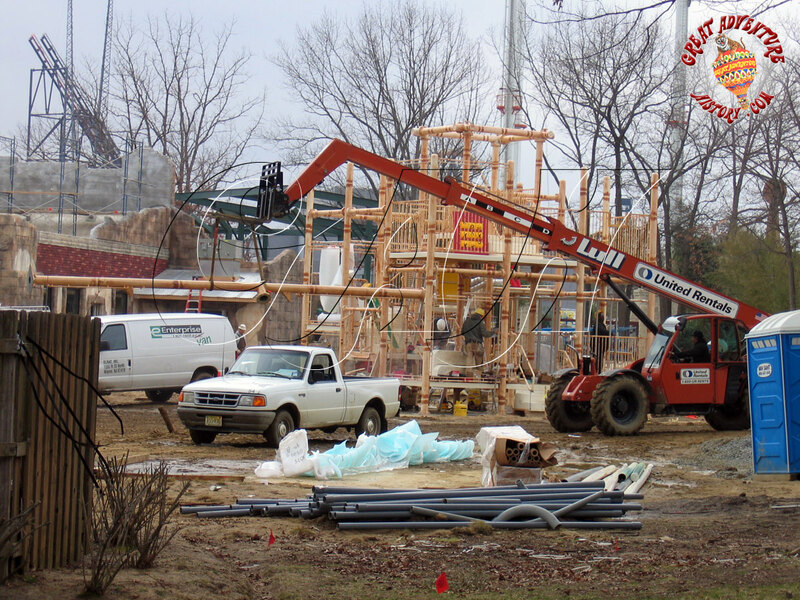 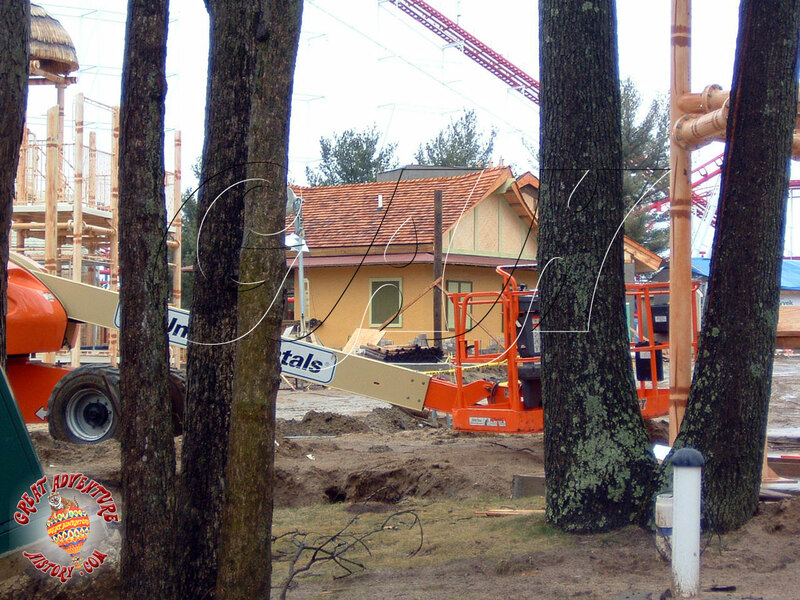 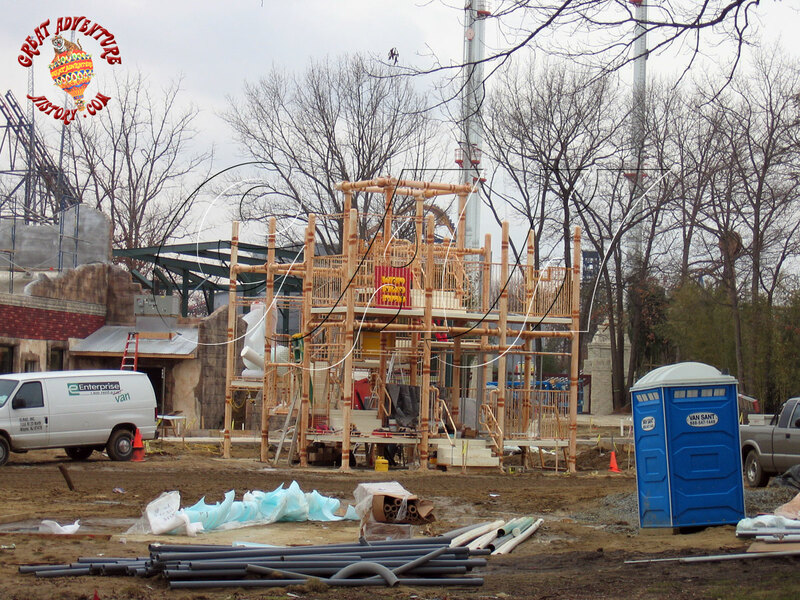 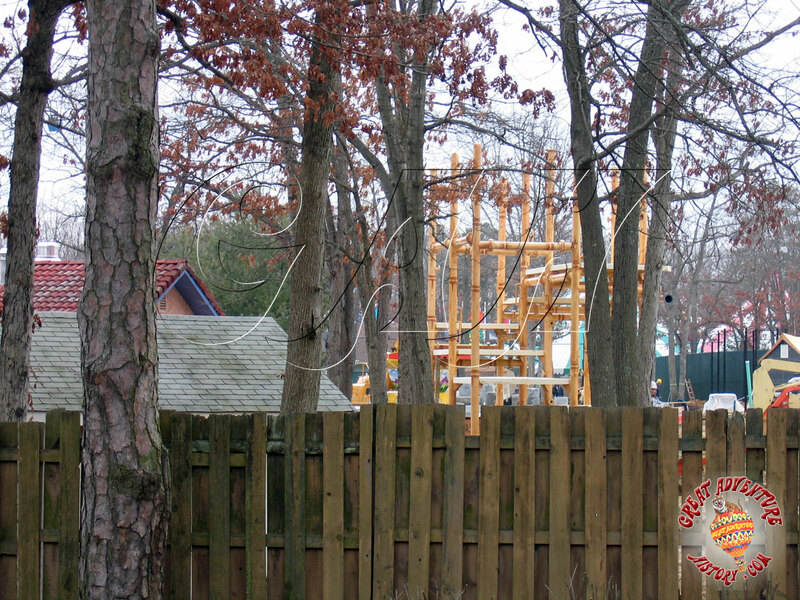 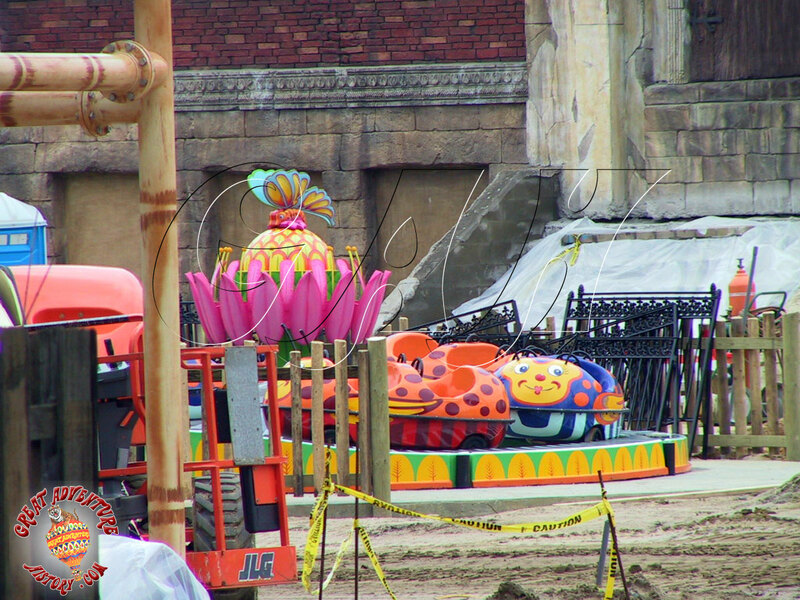 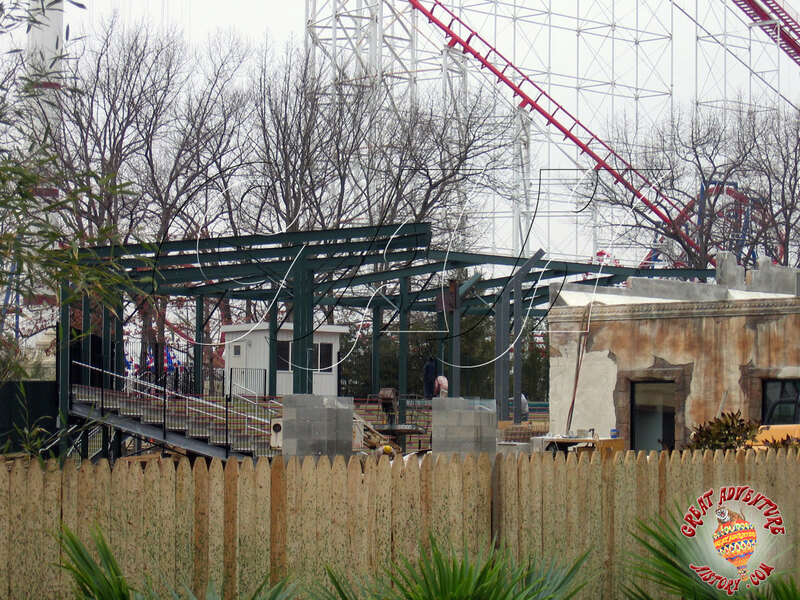 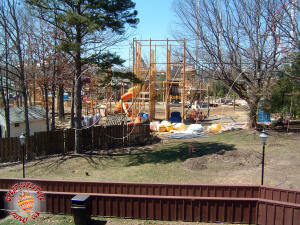 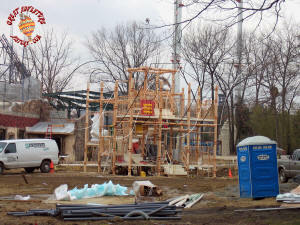 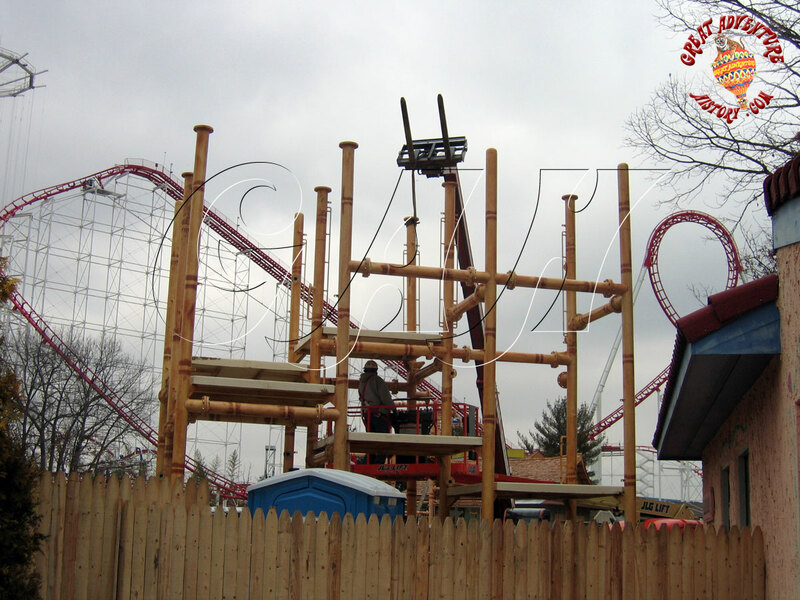 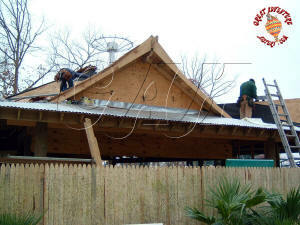 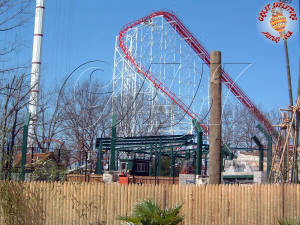 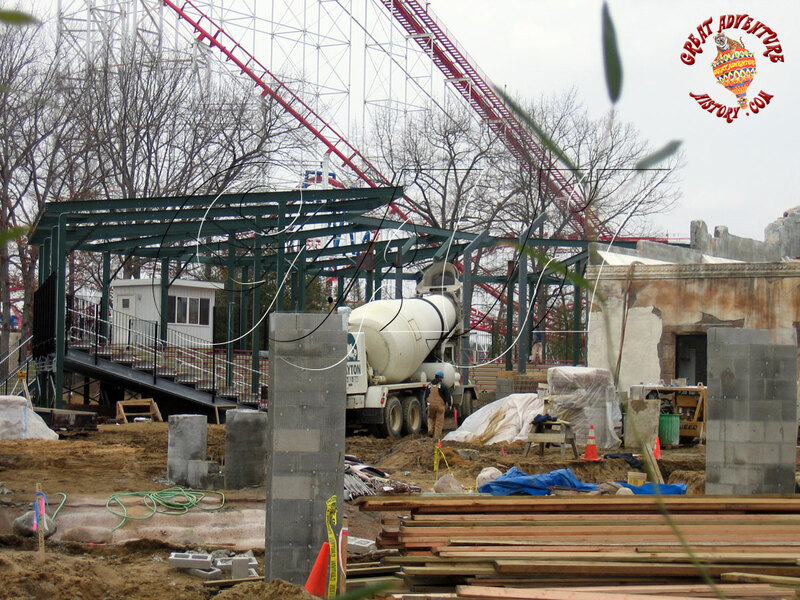 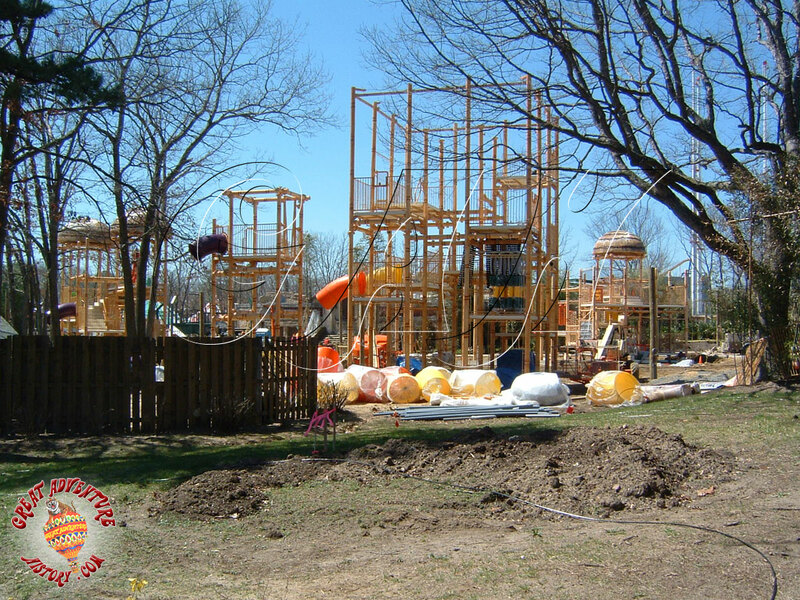 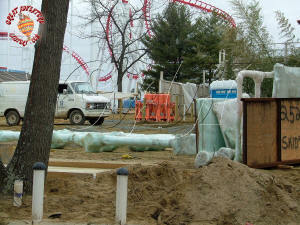 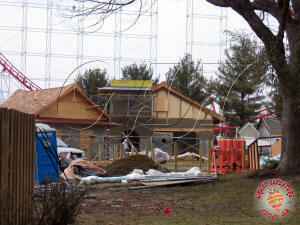 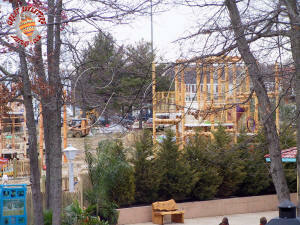 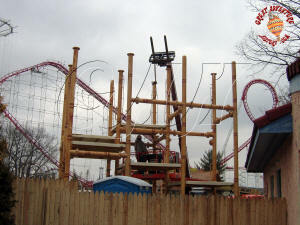 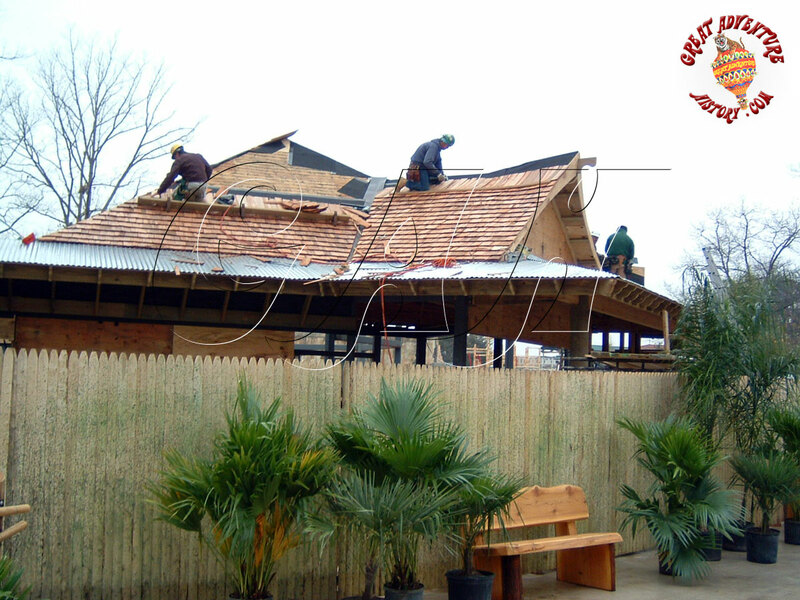 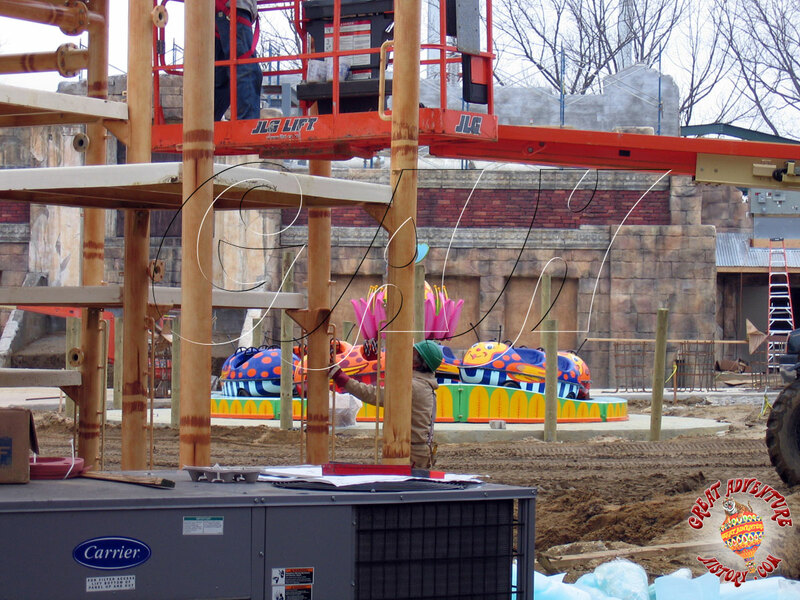 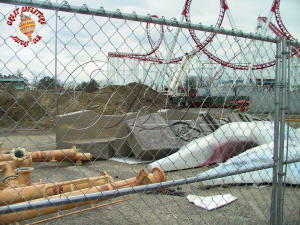 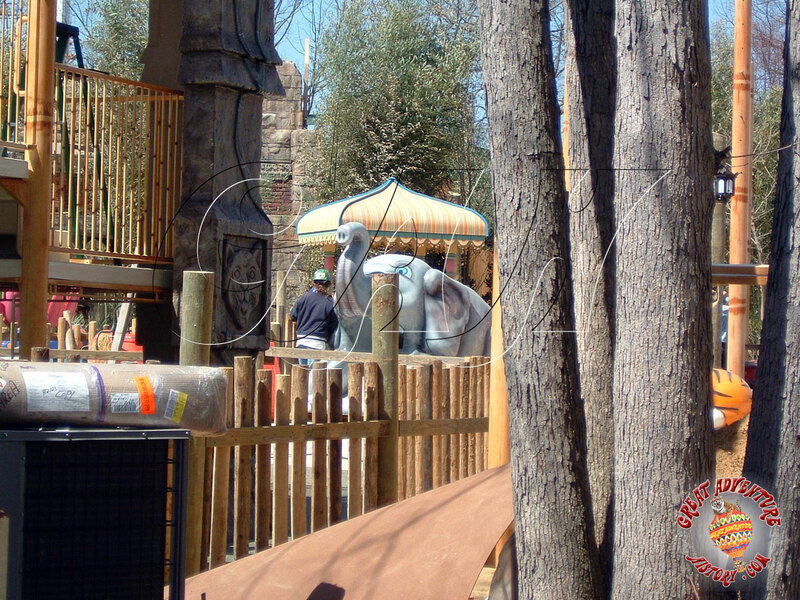 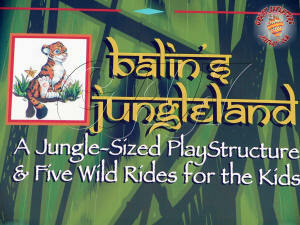 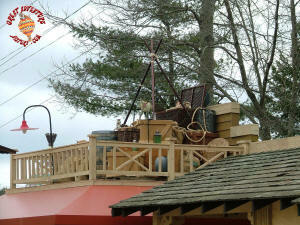 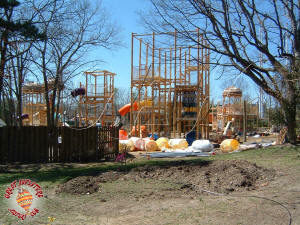 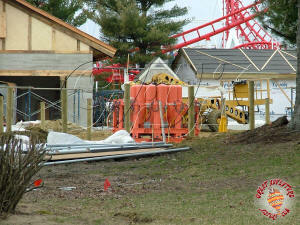 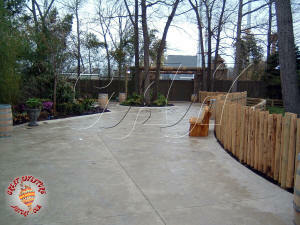 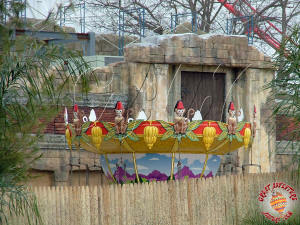 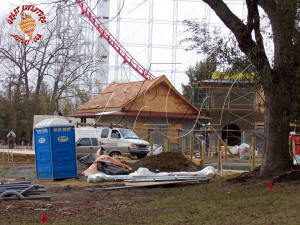 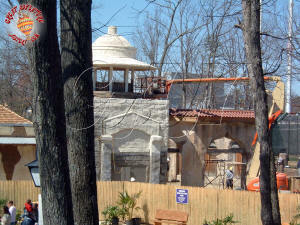 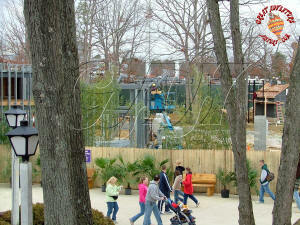 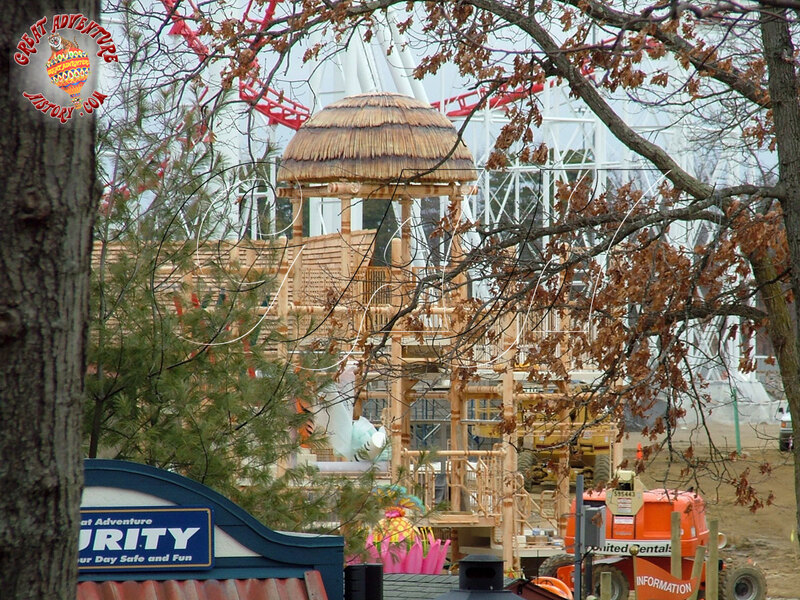 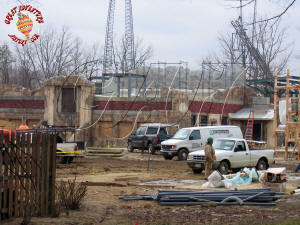 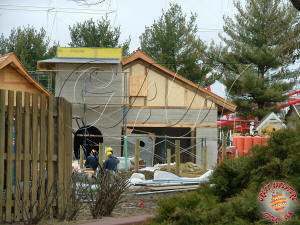 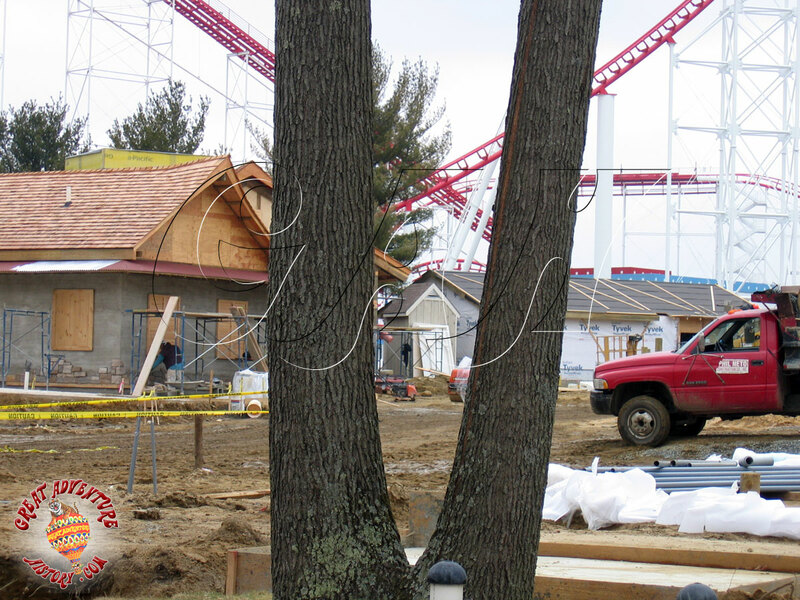 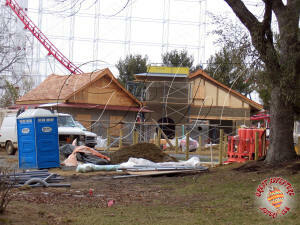 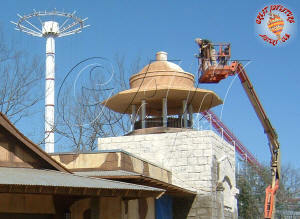 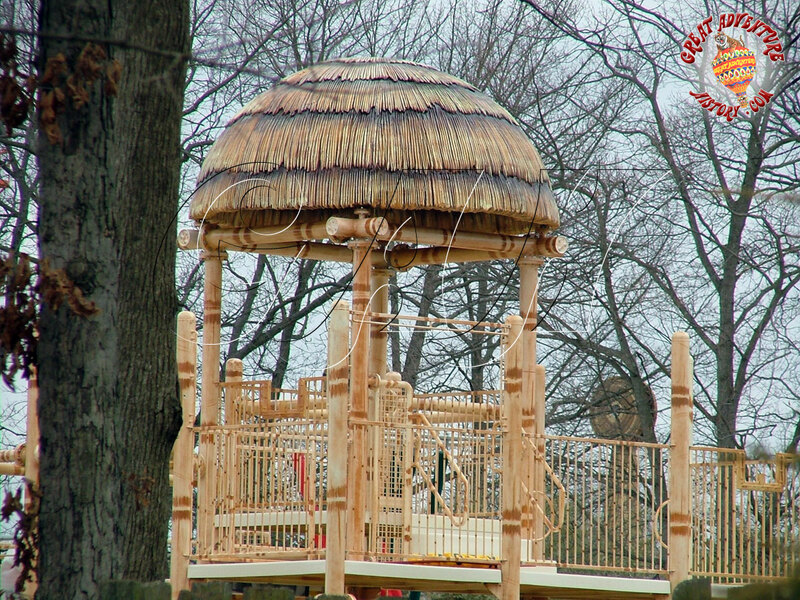 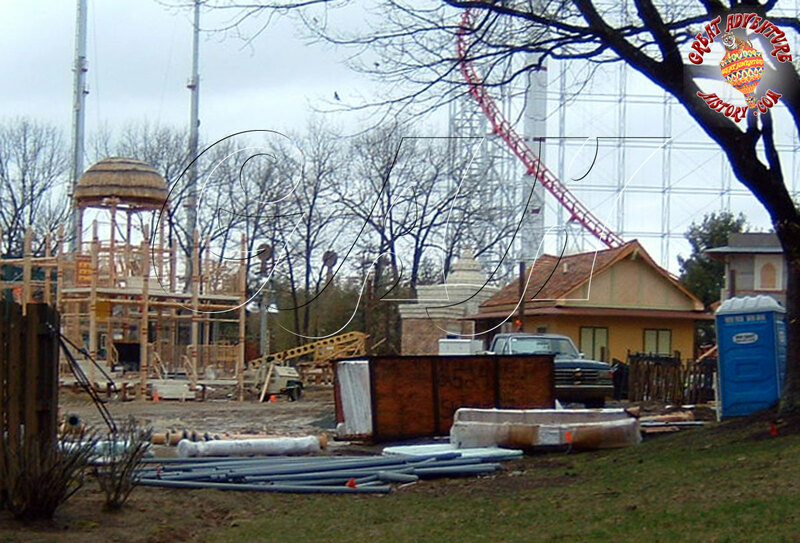 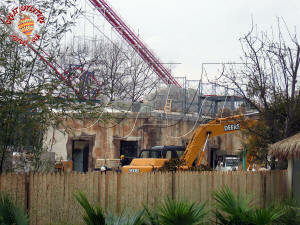 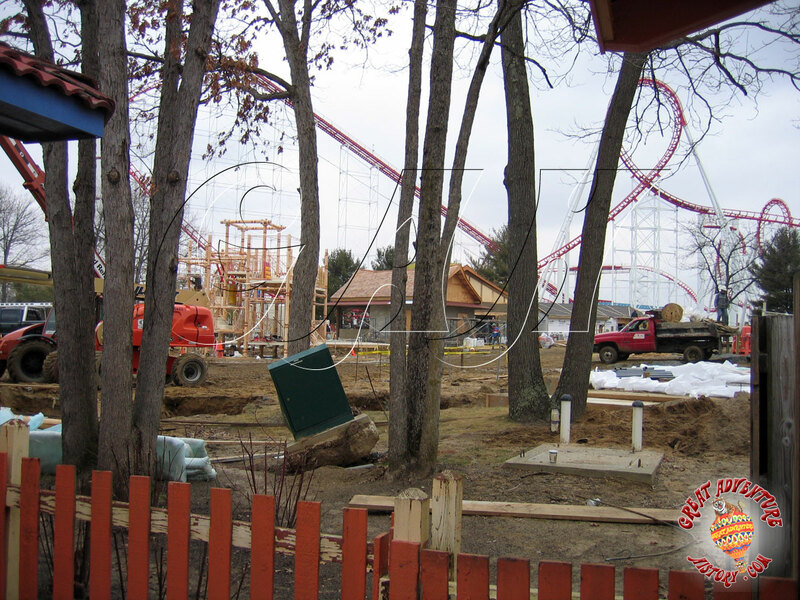 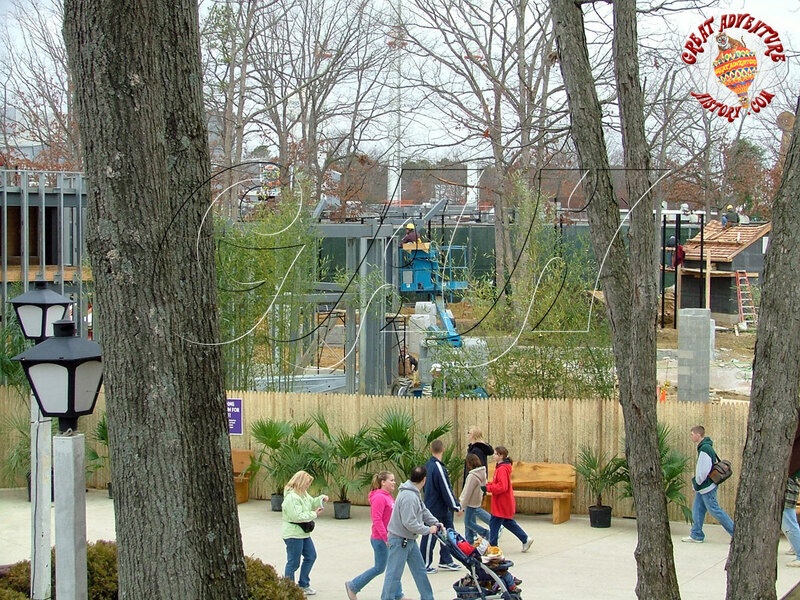 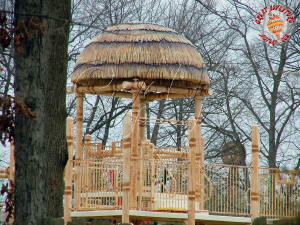 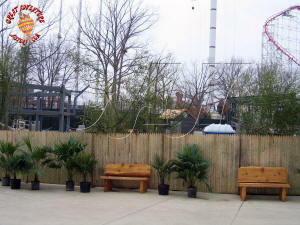 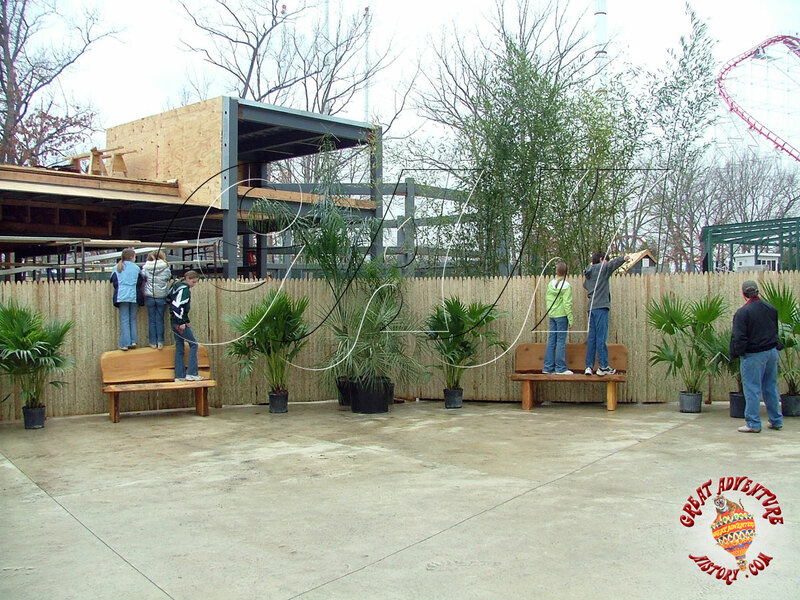 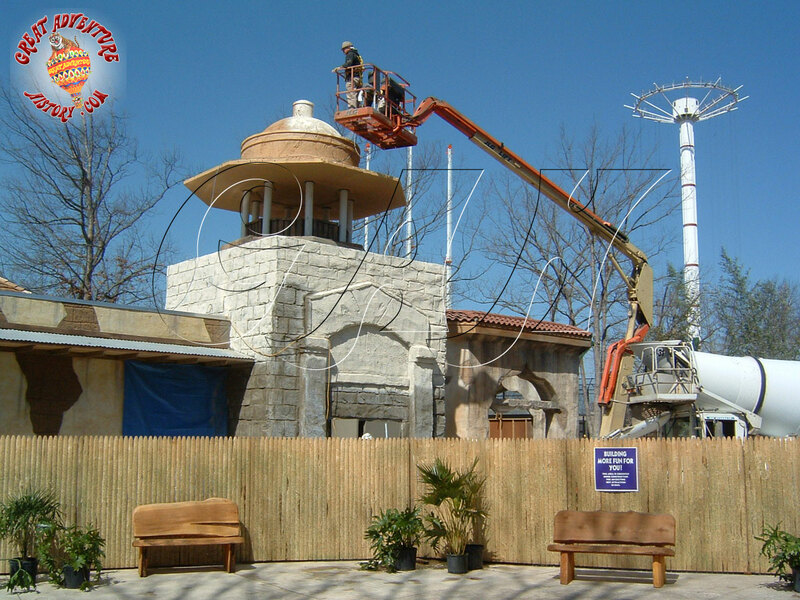 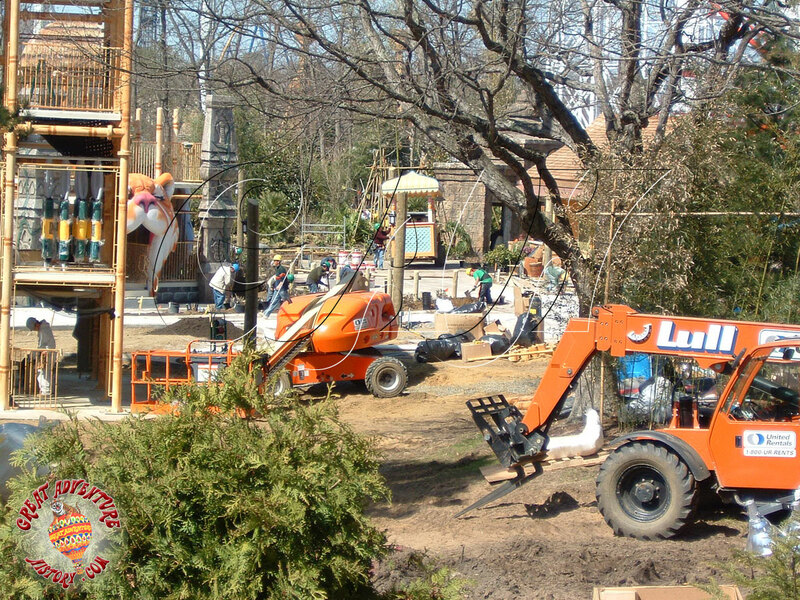 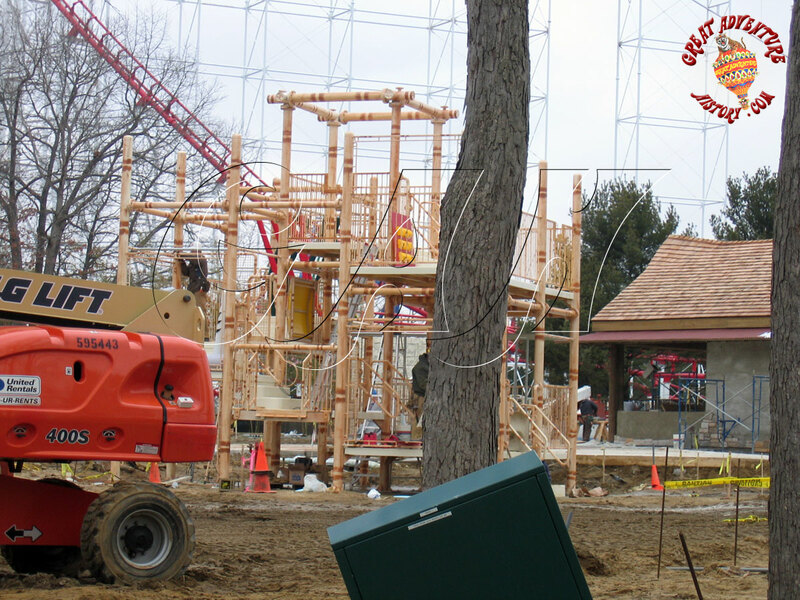 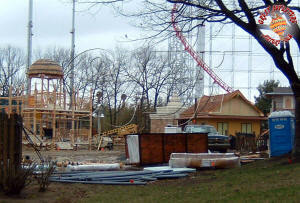 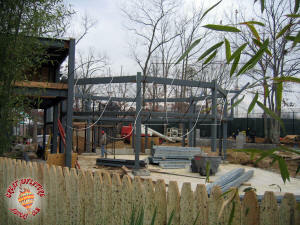 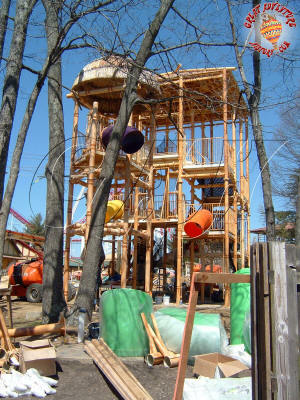 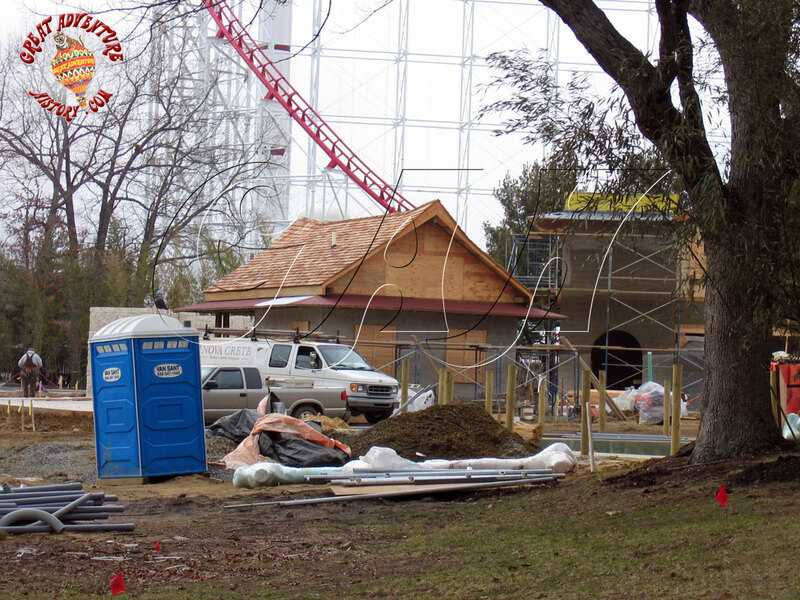 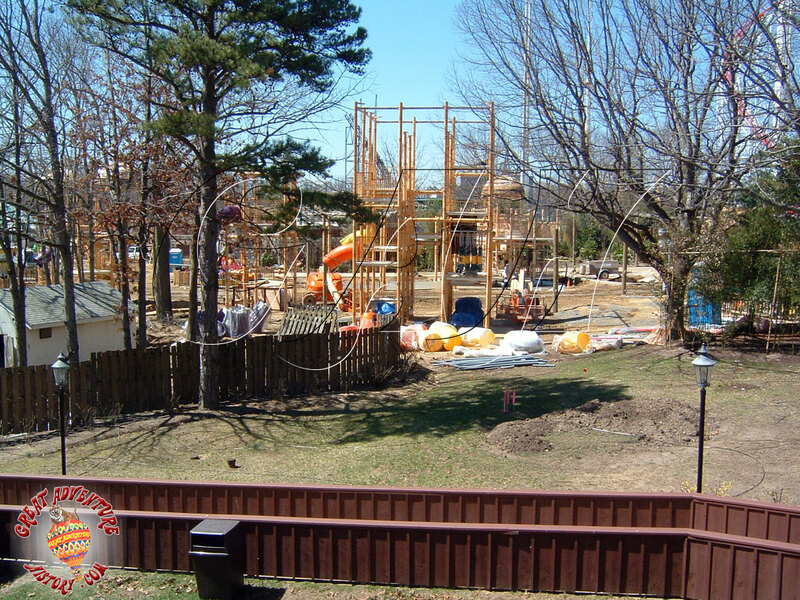 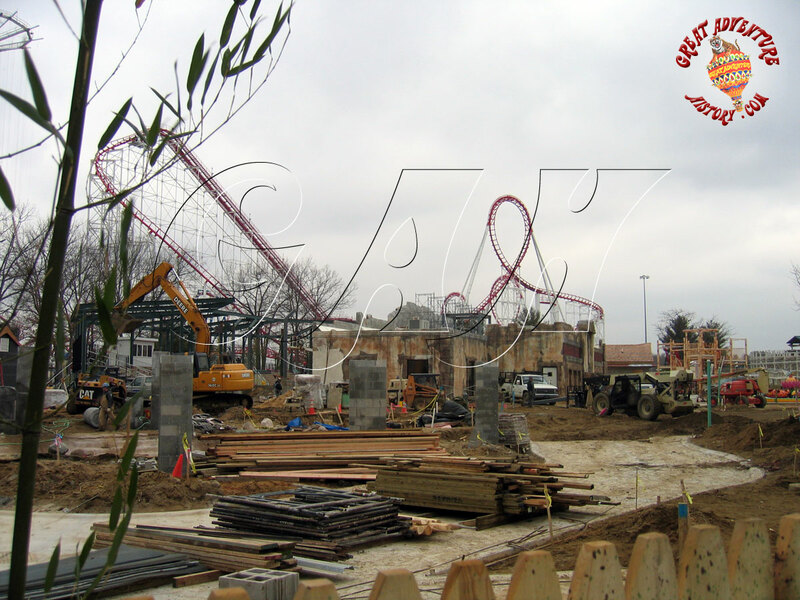 Construction progressed for all of April with the play structures of Balin's Jungleland taking shape along the edge. Being so tall, they were quite visible over the fences as they took shape and were topped off by fiberglass roof structures designed to look like thatch. 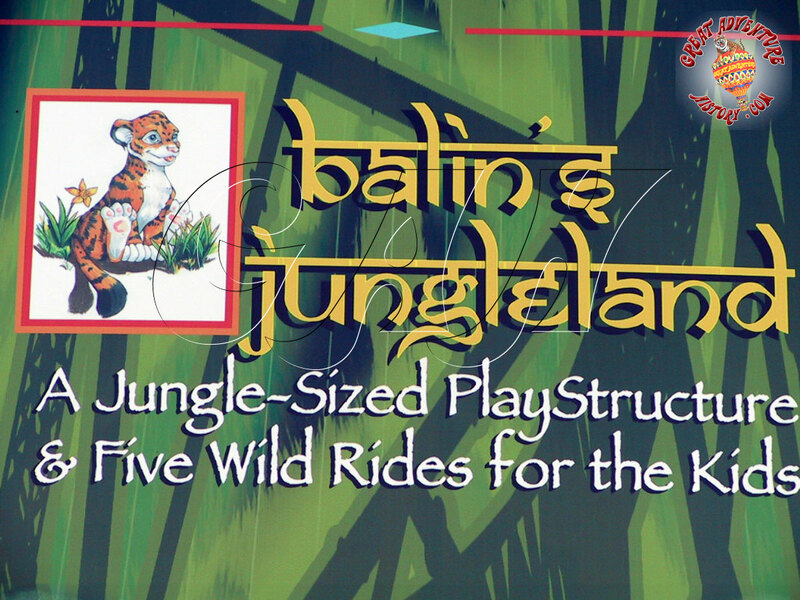 The rides of Balin's also were assembled in the midst of the construction site including the new Royal Elephants ride which was imported from The Great Escape. 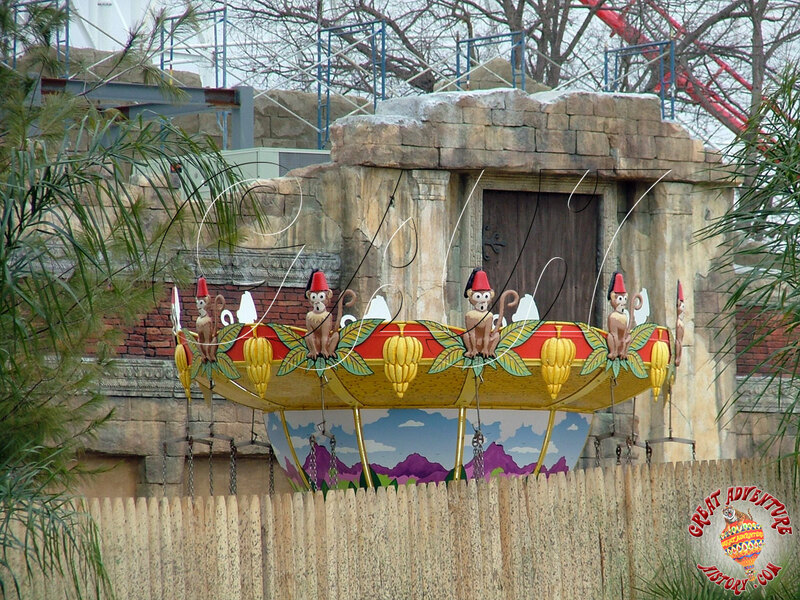 Because most were small and simply modified versions of rides that had been in Bugs Bunny Land, they came together quite fast and looked ready to run while the rest of the area still looked like a muddy mess. 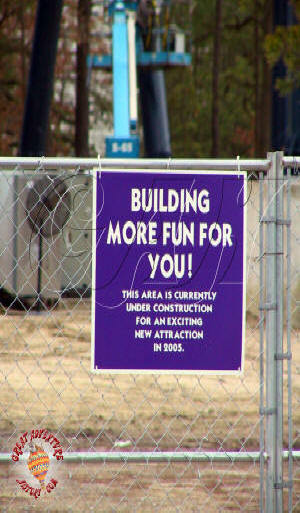 The site harkened back to initial construction of Great Adventure where the flat rides sat complete waiting for pavement and structures to be built around them. 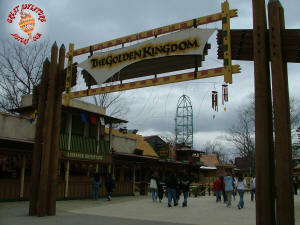 One of the most impressive structures in The Golden Kingdom was the portal constructed at the end of the Boardwalk. 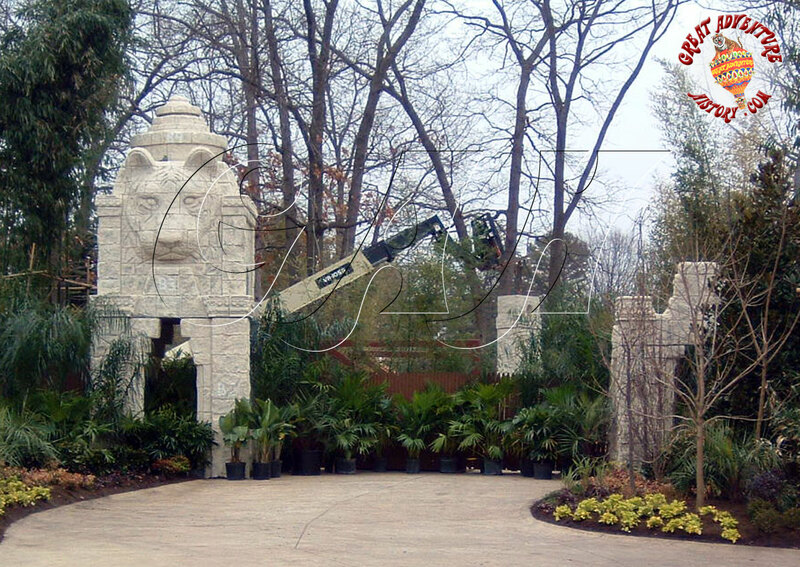 The massive tiger head sculpture and gates had to serve dual purposes as an entry to the new section and as an access for the park's Security and First Aid personnel to be able to move vehicles in and out from the backstage area. The stone and log structure was sculpted to look very permanent, then aged to look like it had always been there. 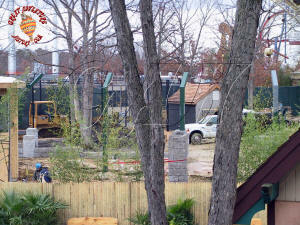 Between the logs a massive pair of gates were installed that could swing one direction to close off the guest access and allow vehicles to pass unseen or swing the other direction to block the access road and allow the flow of guests through the area not even realizing that the access road was there. 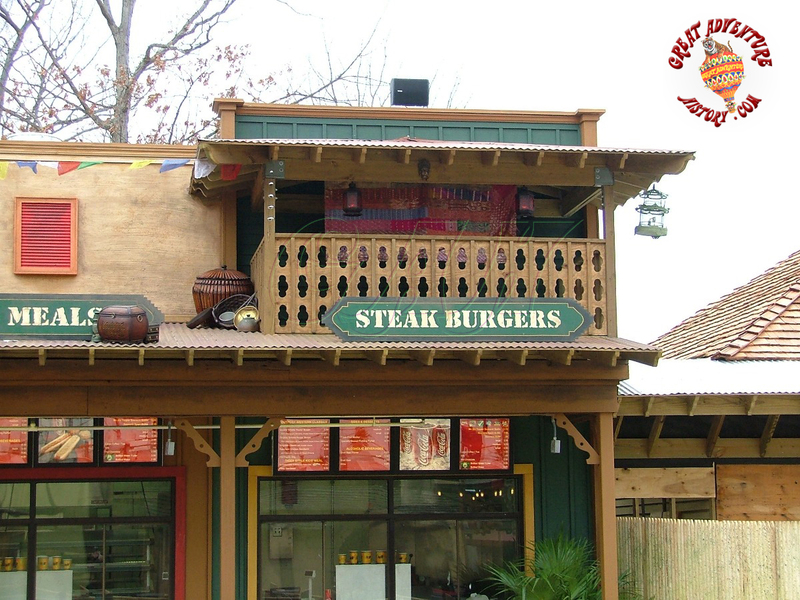 Two of the most impressive transformations of existing structures happed to the Kandy Kitchen shop and one of the buildings that had been a covering for the children's play elements in Bugs Bunny Land. 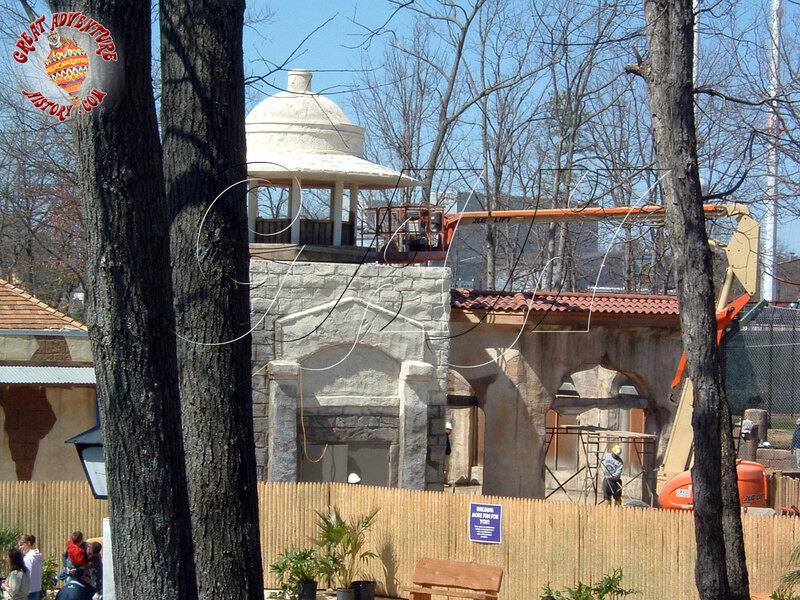 The former Kandy Kitchen was transformed into Kingdom Traders with an update of the facade, modifications to the roof lines and an addition which led into a courtyard looking out into the tiger habitats. 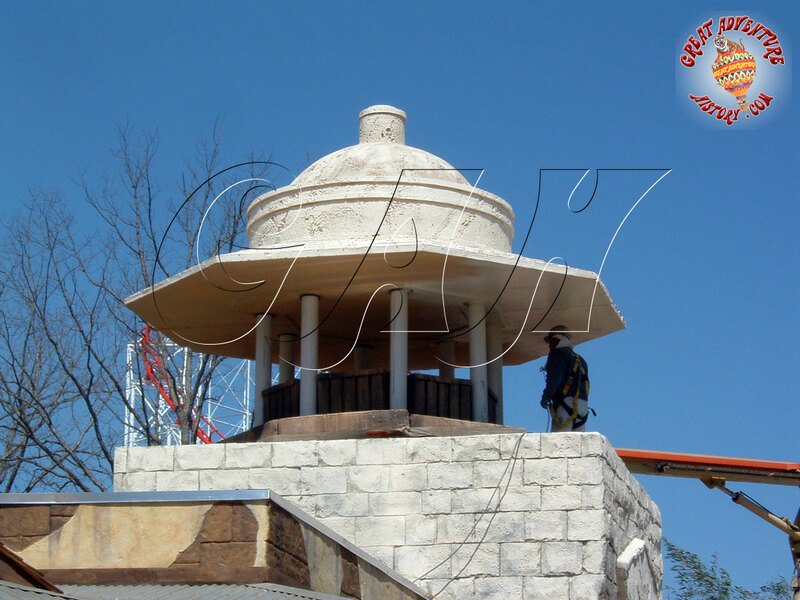 The new roof lines took on an Asian look with turned up corners and wood shingles and an Indian style tower was added to the far end where the addition was built. 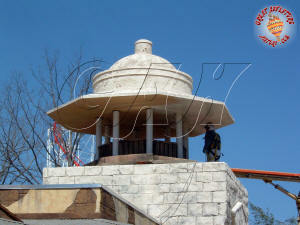 The tower was topped by an elaborate dome structure and a smaller central dome was added at the roof's apex. 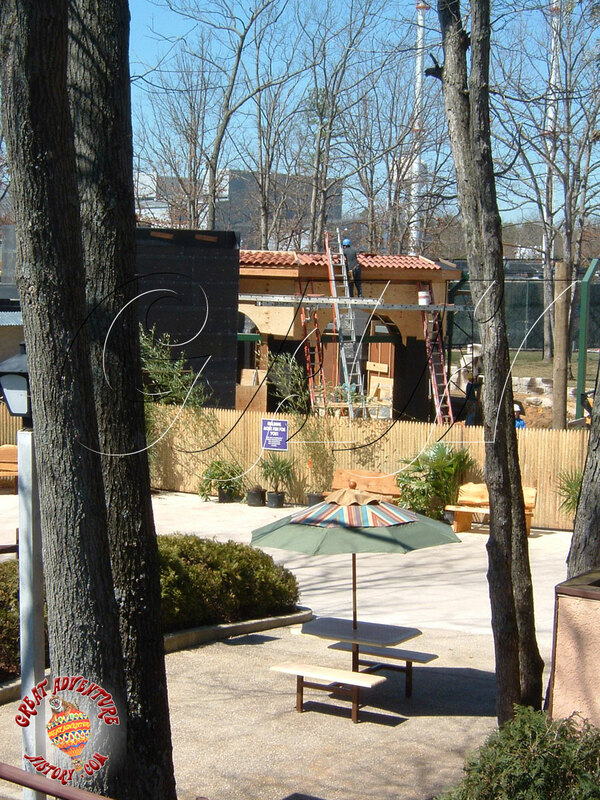 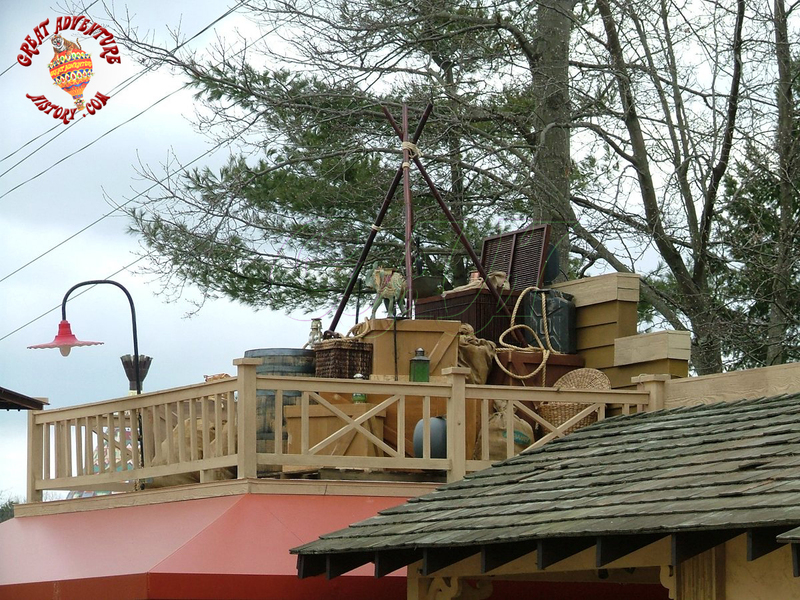 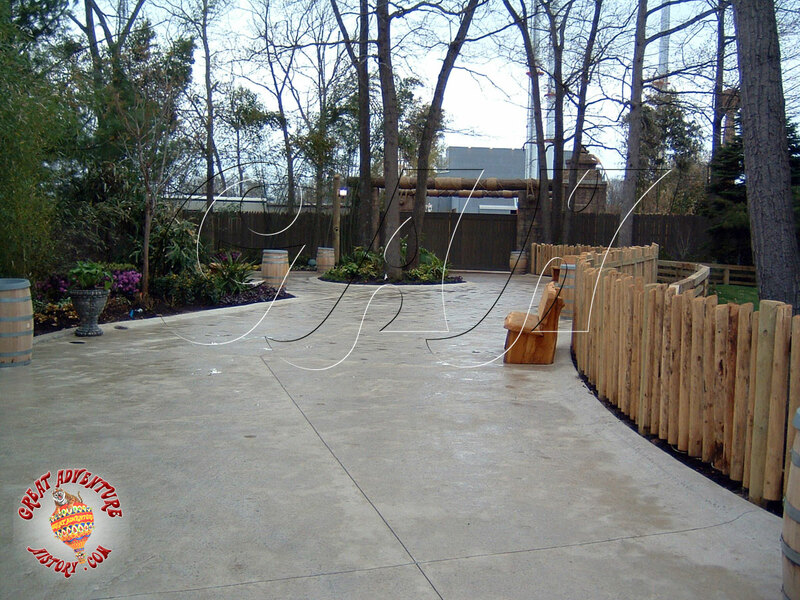 The structure that had covered the Elmer Fudd Fun Factory play area got the most impressive makeover as it became Balin's Bazaar. 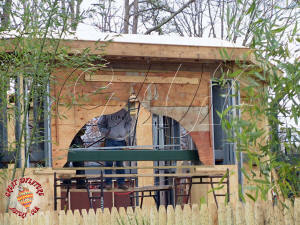 The finished shop bore little resemblance to the utilitarian structure it had been and the shop's exterior was one of the most elaborate facades in the Golden Kingdom. 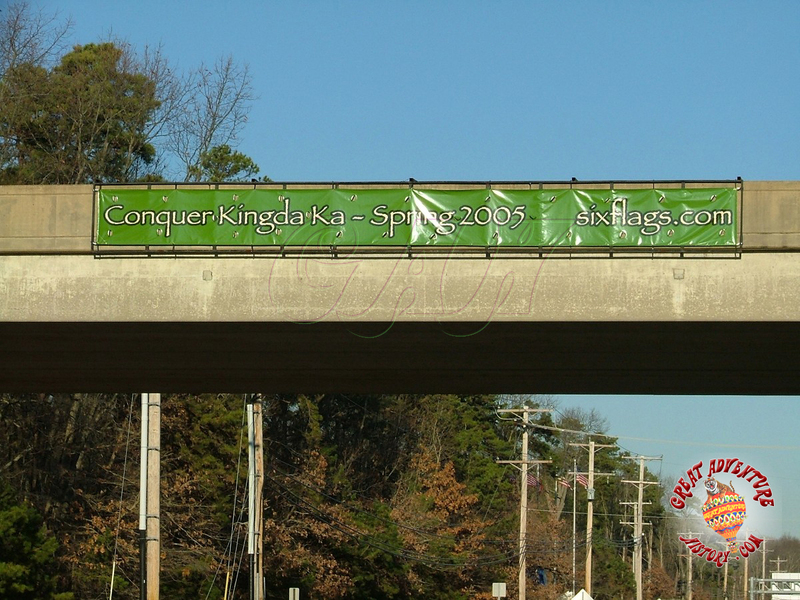 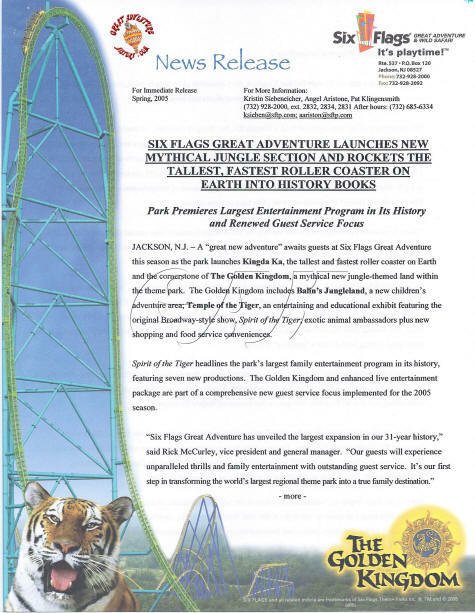 With the final details falling into place, The Golden Kingdom was ready to open before its centerpiece, Kingda Ka, was ready to make its debut. 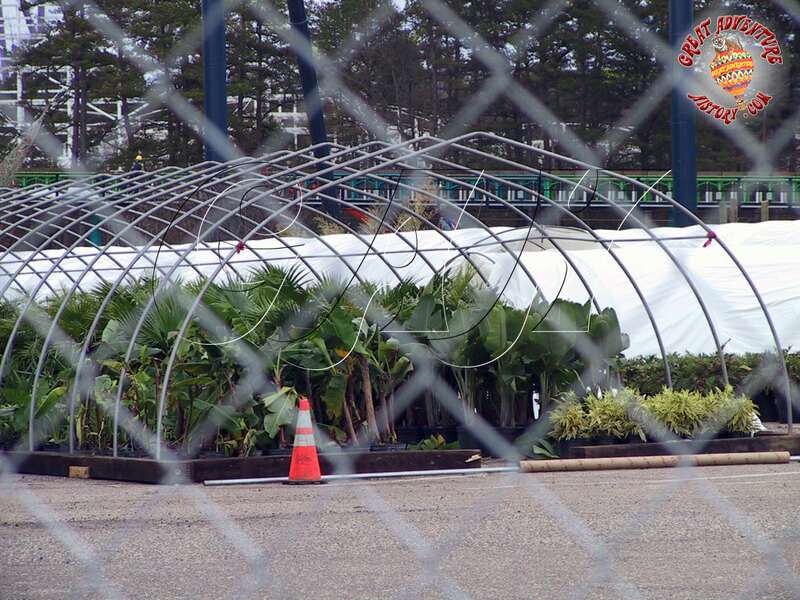 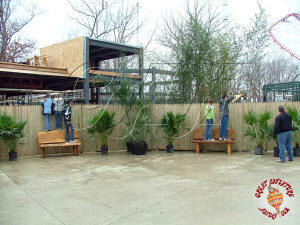 The piles of building materials in the parking lot staging area dwindled and the tropical plants that had been housed in makeshift greenhouses began to make their way into the park as the project neared completion and the weather continued to warm up. 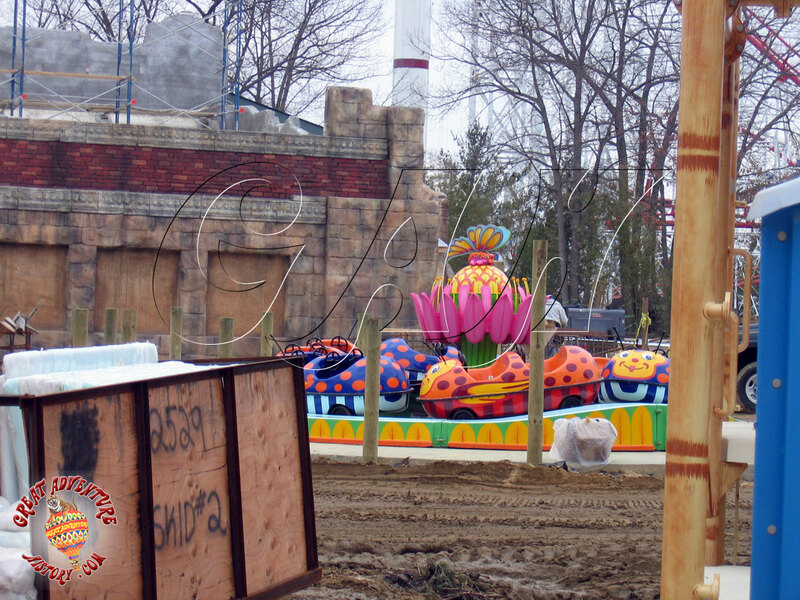 on April 22nd, season passholders got to enter The Golden Kingdom for the first time and experience first hand just how amazing the theme elements were for themselves. 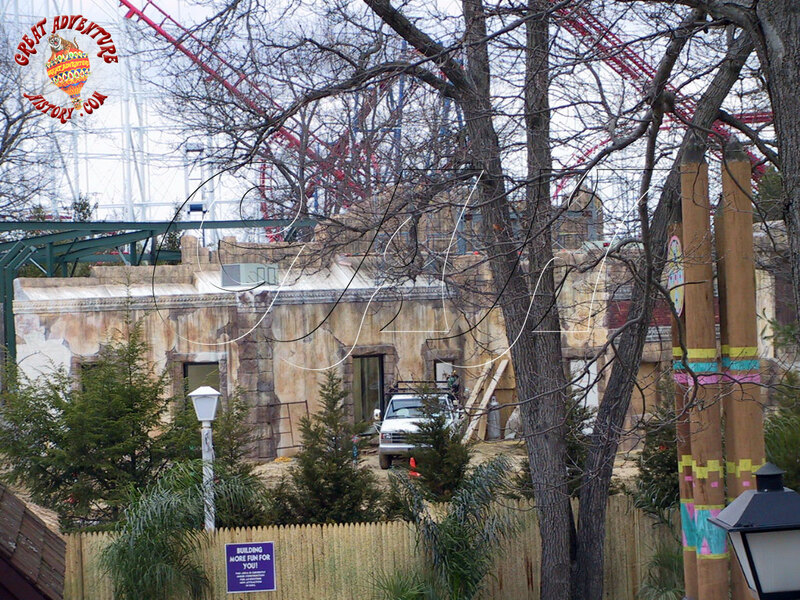 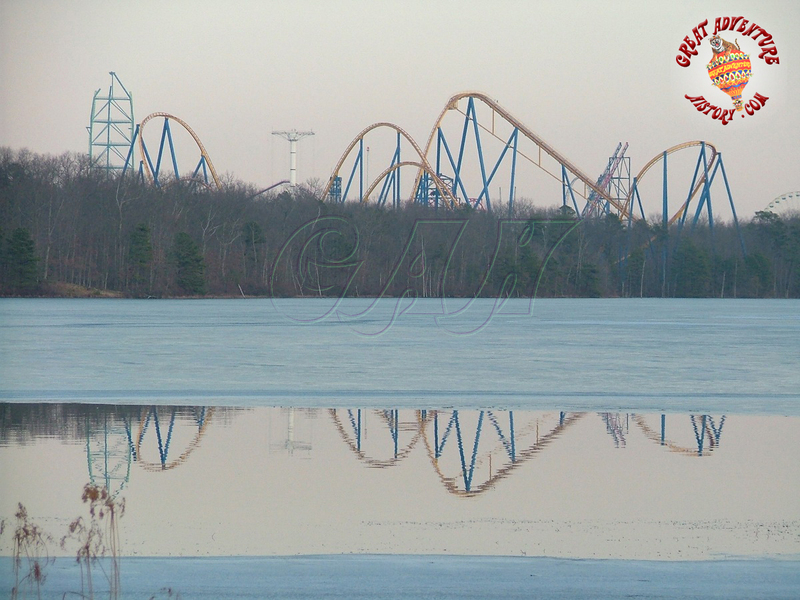 Kingda Ka would still be several weeks from opening and the Spirit of the Tiger show was just beginning rehearsals as the animals were acclimating to their new surroundings.